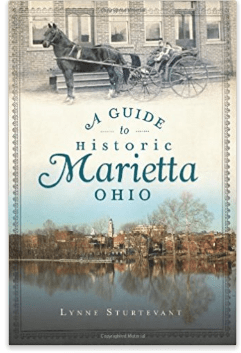 Recently I attended a press trip to Marietta, Ohio and I was totally blown away with how many things there are to do there! 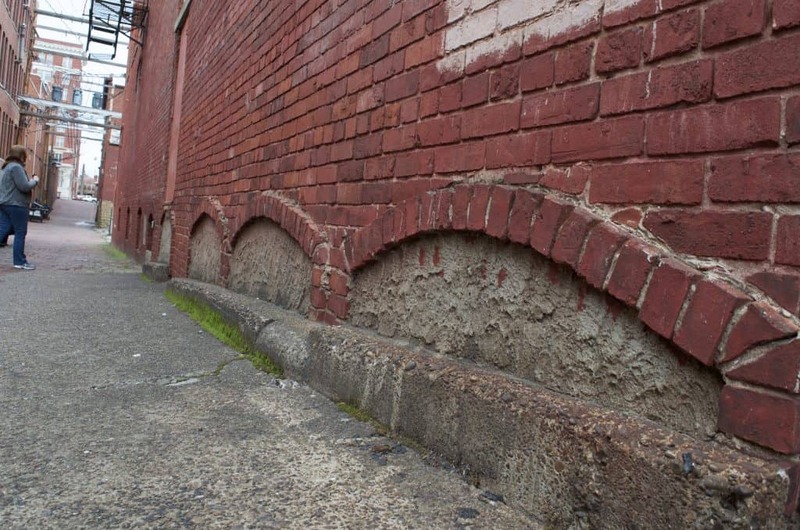 The area was established in 1788 and I have found that some of the oldest areas of our country are the most intriguing! It’s simply a gorgeous area with a fascinating history. 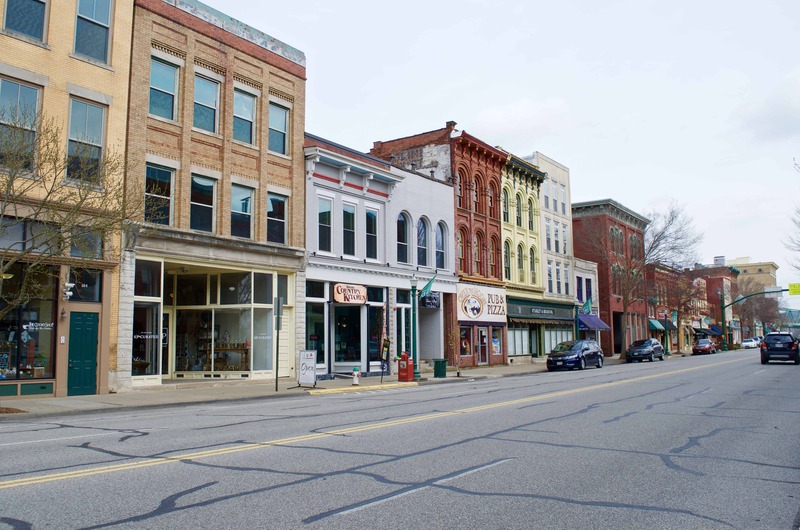 If you love talking to people just walk up and down the streets in Marietta stopping in the shops and spend the day chatting with the locals – you’ll dive into a culture all of it’s own! 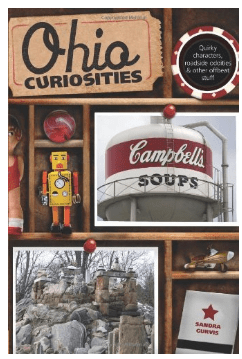 You can check out our first post, Incredible History Captured and Created Right Now in Marietta, Ohio, for just a few ideas of fascinating places to stop. 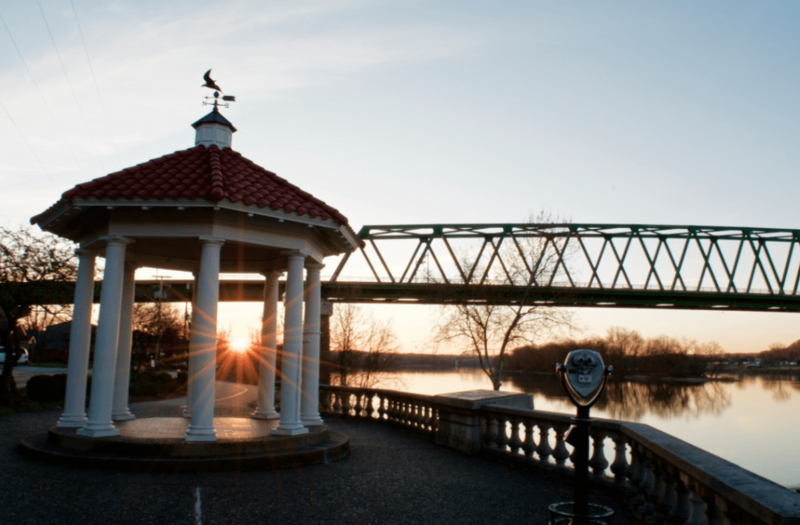 If you are planning a visit to Marietta, Ohio I’d like to recommend 2 great places for you to stay! 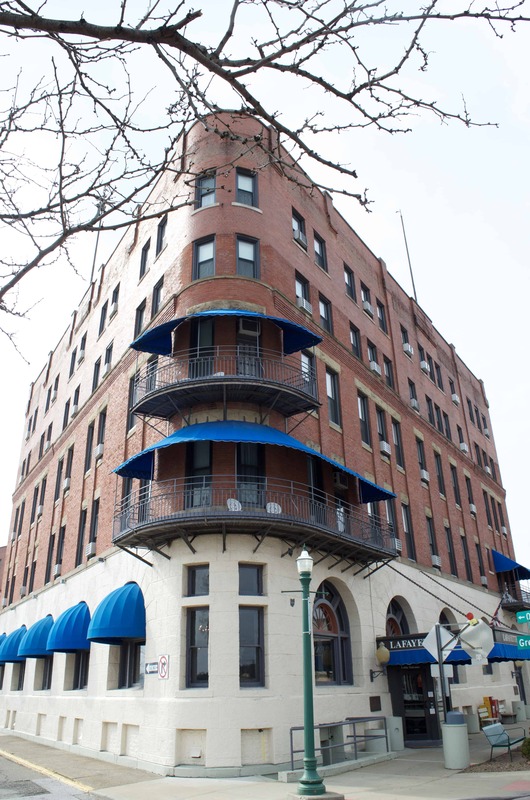 Before The Lafayette Hotel stood here the Bellvue Hotel was built in 1892 – it was just $2 a day to stay there! In 1916, however, a fire destroyed the Bellvue Hotel which you can see photos of in the Gunroom Restaurant of the Lafayette Hotel. 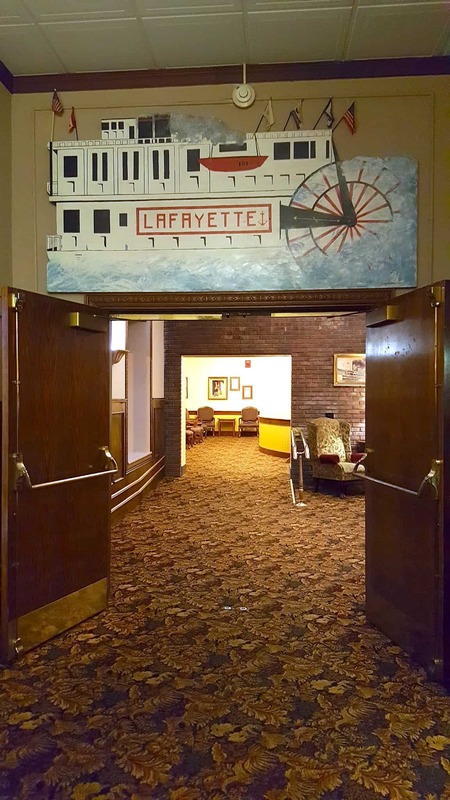 The Lafayette opened in 1918 and has allowing visitors to enjoy the surrounding area….with perhaps a few ghosts mixed in. 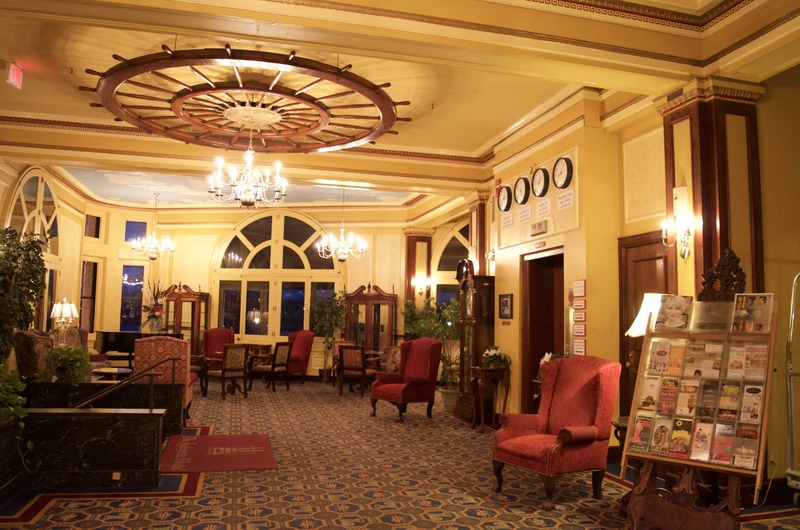 You can learn more about this historic hotel, it’s floods, fire and haunts on the Hidden Marietta Tour which I highly recommend. The hotel is right off of the river so it’s a gorgeous walk and view at night. Plus the architecture of the building is pretty cool! What I love about this hotel, aside from the fact that it has a gorgeous view, is that it is right on the main street in town. 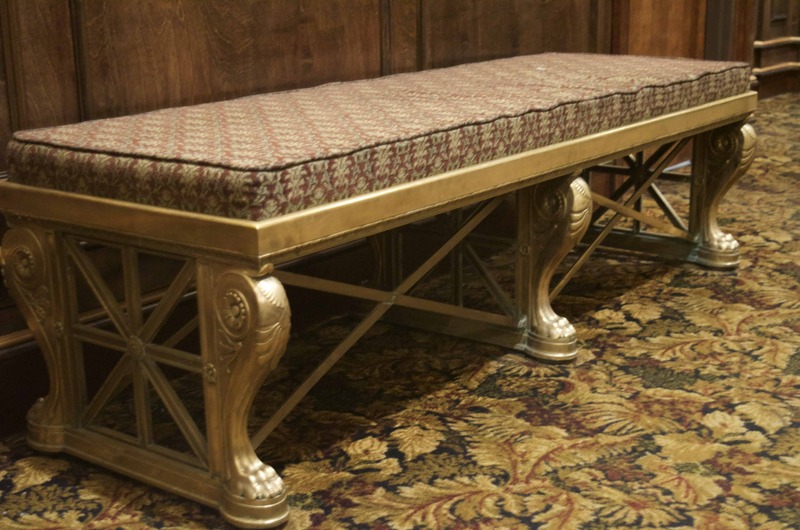 If you love boutique shops and just browsing you absolutely must stay in The Lafayette Hotel. As you would imagine with a historic hotel, the inside is older but nicely decorated with time period replicas and history from the past. 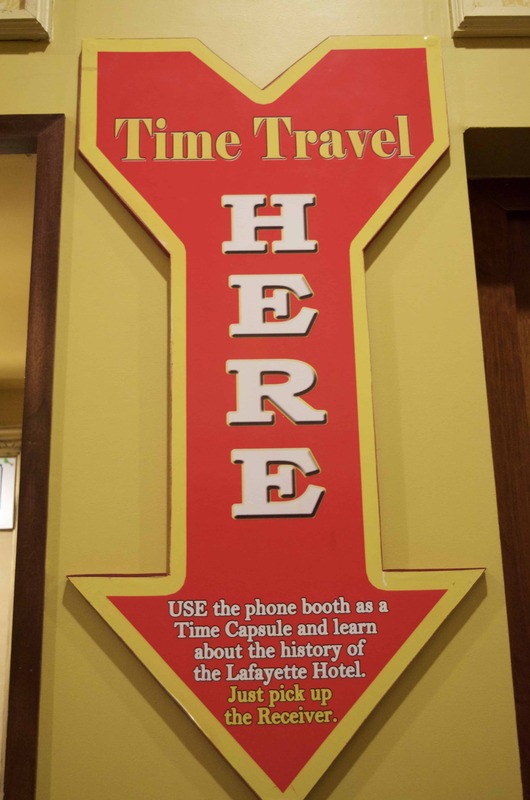 Right near the front desk is an awesome “time capsule” where you can still walk into an old phone booth. 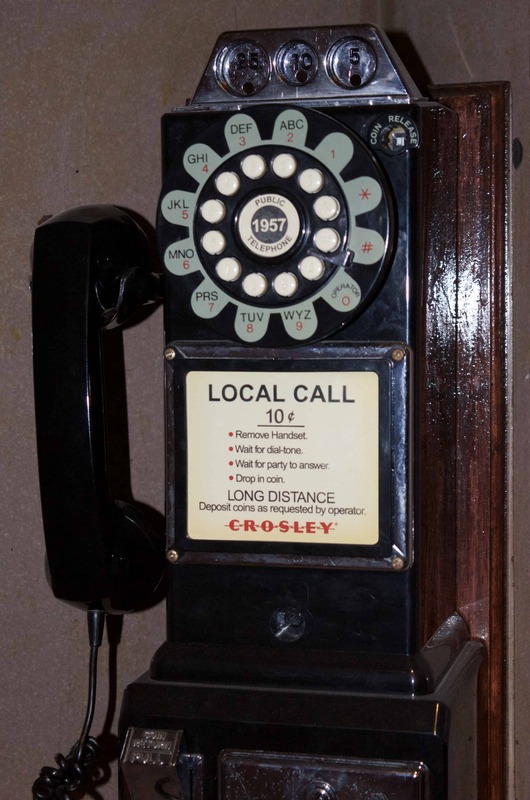 But instead of making a call to someone you can listen into the phone for a historical account of the hotel! It was pretty cool! I had a fabulous room right off of the elevator which had a nice river view off of the parking lot. 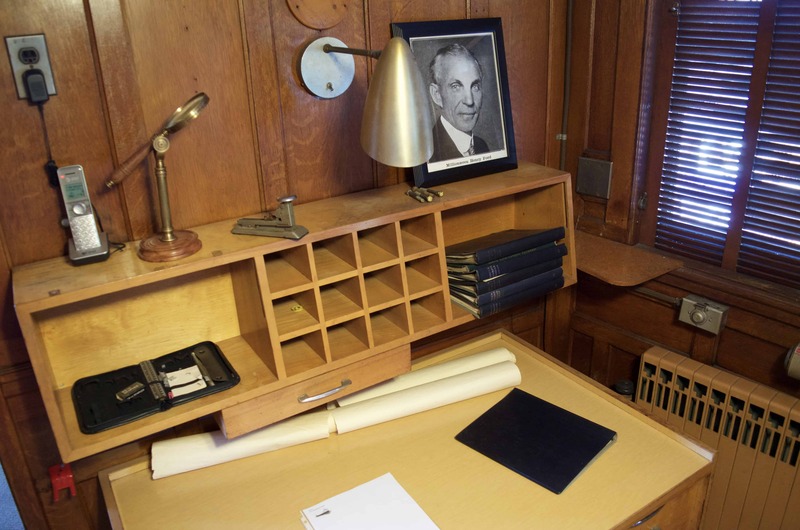 Look how ornate the bed frame, lamp, and desk/mirror are! Although I didn’t spend much time in the room it was a great cozy spot to work in! 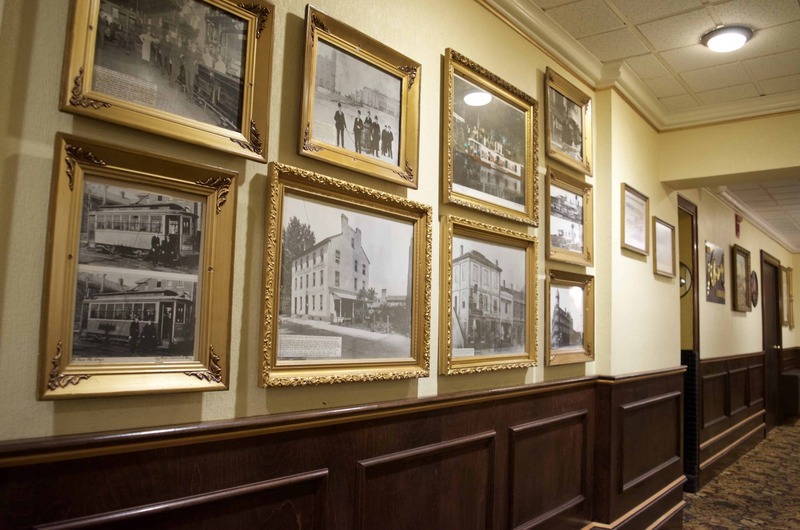 As you get lost wandering down elegant hallways you’ll find a vast collection of historical photos, replicas, and artifacts from Marietta’s past. These were two of my favorite signs! I wish my kids were with me because they would have loved seeing all of the old steamboat pieces displayed. Down in the Gunroom Restaurant on the main level of the hotel you can find a Comedy Club and all sorts of events to participate in – even if you’re just passing through! The food was great too! We started our first day on a walking tour with Hidden Marietta and it was such a treat! Although I have to admit, if you get a little spooky about ghosts I would leave that tour until the end of your trip! As we learned during our visit Marietta has had some pretty terrible floods come through town and you can see the markers on local businesses to see where the waters hit. In fact the original town was built a level lower than it currently is. It was raised in hopes to decrease damage from flood waters. 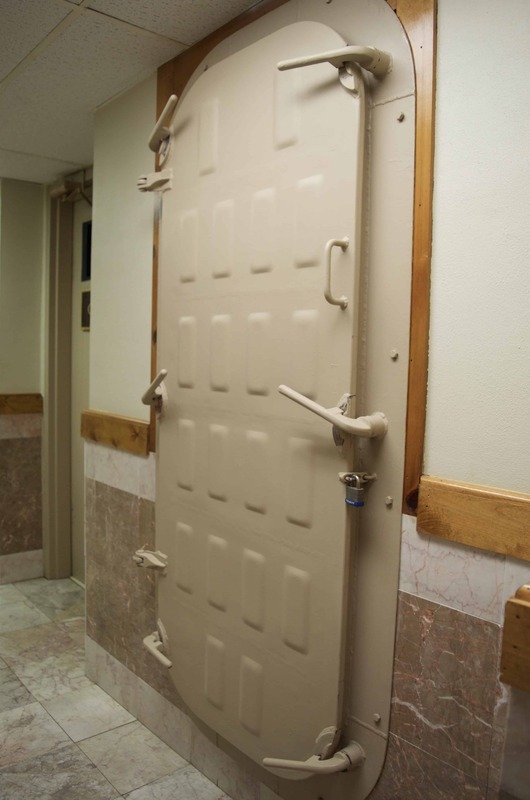 While exploring The Lafayette Hotel one night I came across this spooky locked steel door in the basement – so you never know what you will find in town! 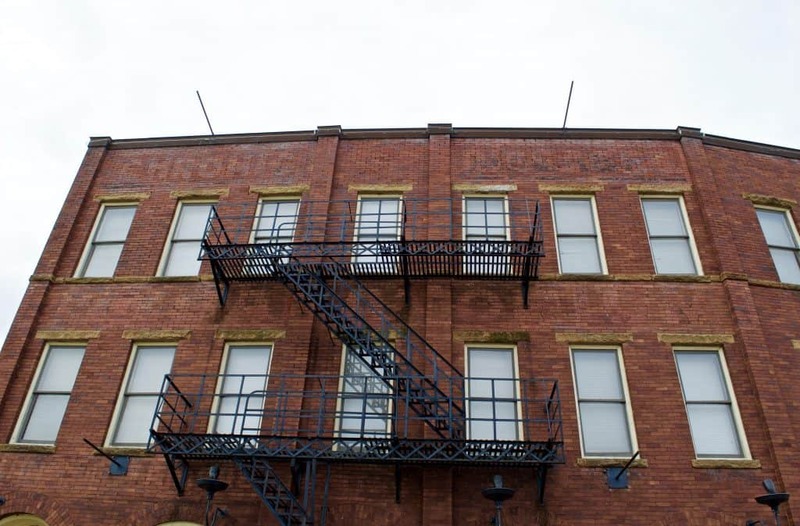 You can follow The Lafayette Hotel on Facebook here. 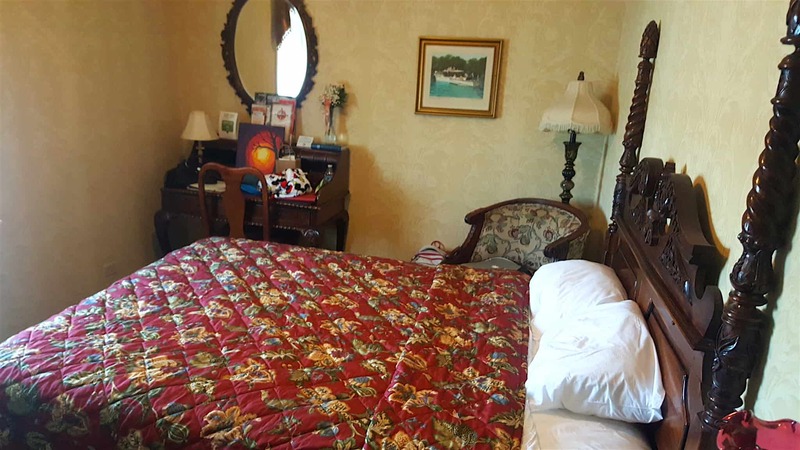 If you prefer to stay out of the heart of town and in a more quieter homey location then stop in to stay with Judy at The House on Harmar Hill. 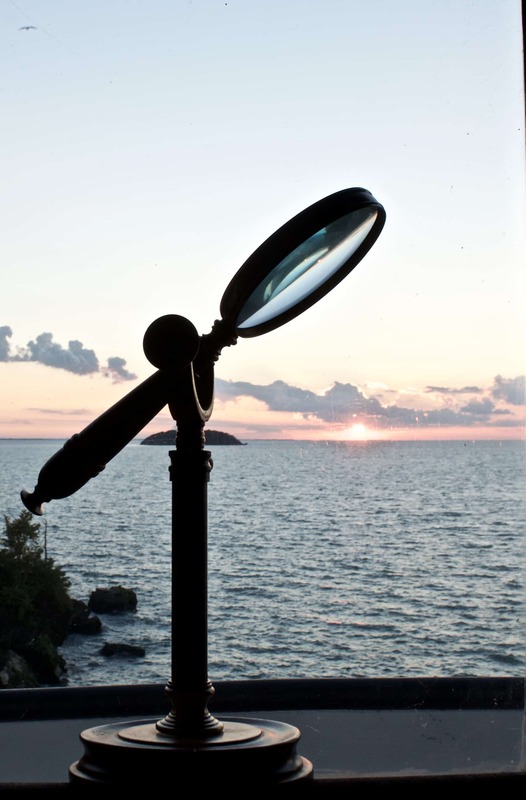 You absolutely will not be disappointed – and you won’t find a better view in town! Located on 300 Bellevue Street in Marietta this is a fully restore 1901 Queen Anne Victorian home with a rich history. Please take full advantage of the gorgeous wrap around porch that overlooks the town of Marietta. 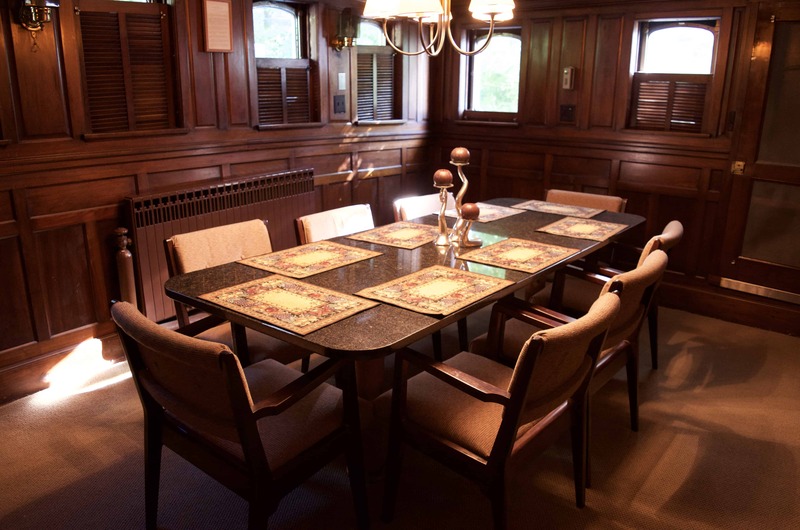 Intricately carved woodwork, elegant decor and incredible molding are just a few of the beauties you’ll discover here. The Innkeeper is incredibly friendly and made some AMAZING fresh scones for us! Her dog Cooper is extremely well-behaved and helps keep the bed and breakfast homey. 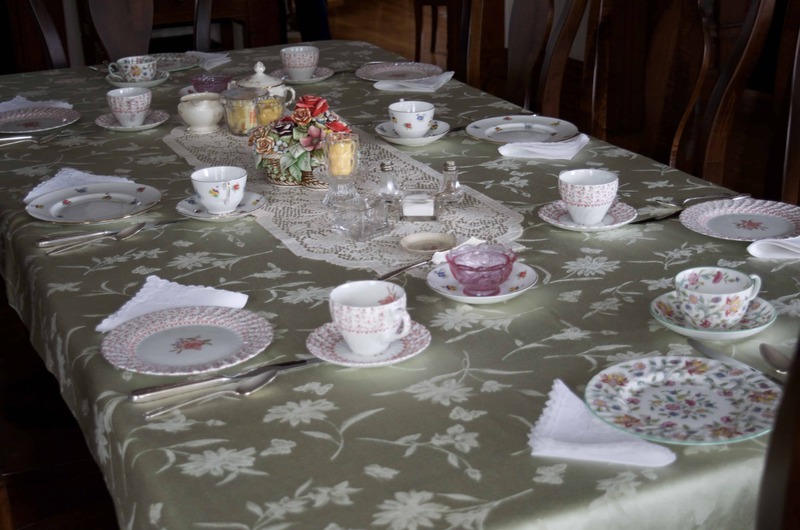 My in-laws love bed and breakfast locations and I’ve already recommended this one to them! When you first walk in you’ll just gasp WOW! It’s simply exquisite. 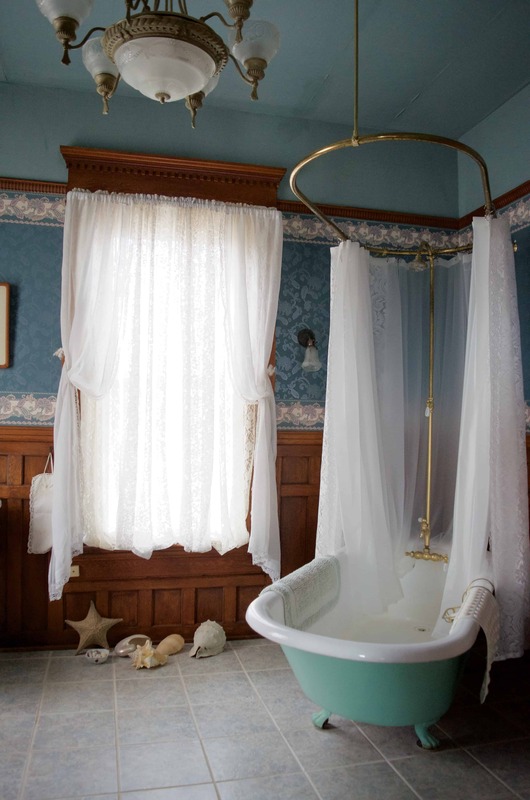 Would you believe that this bathroom upstairs still holds the ORIGINAL bathtub AND toilet! 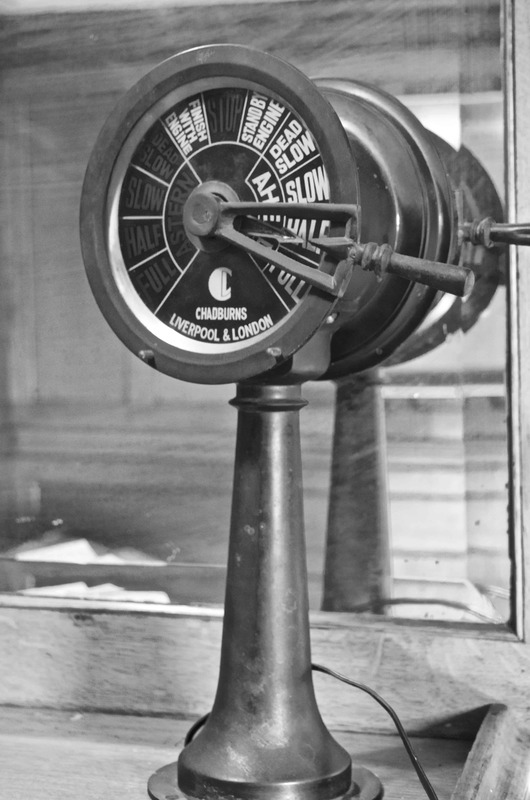 YES – running water and an indoor toilet – talk about futuristic for 1901! It was just beautiful! 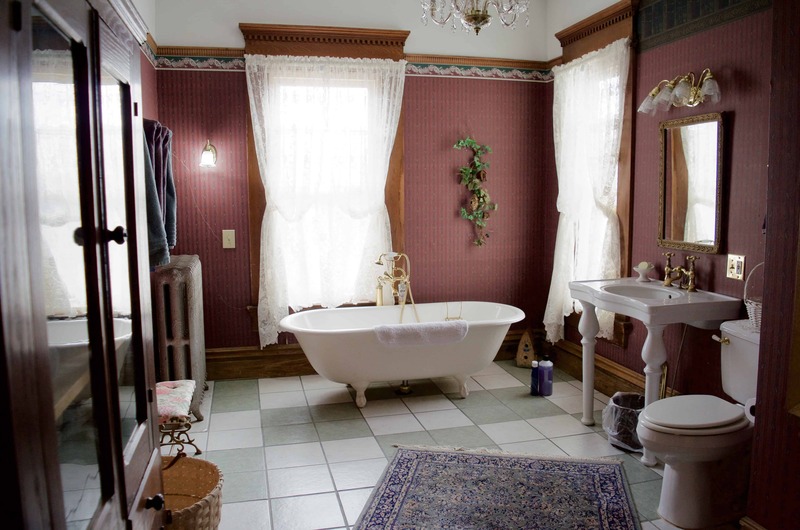 The old maid’s quarters has been turned into an elegant spacious bathroom – look at the size of this! 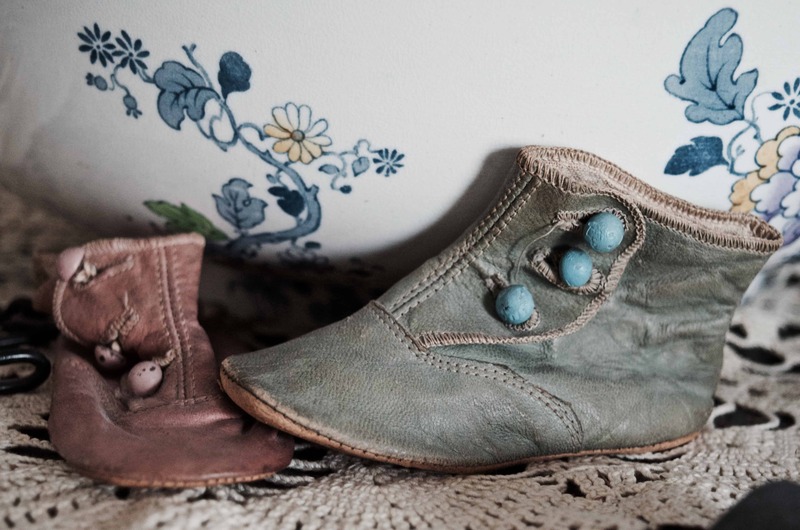 Thankfully we had a little bit of time to wander around inside and throughout the entire place I found delicate touches of an earlier time like these small shoes. 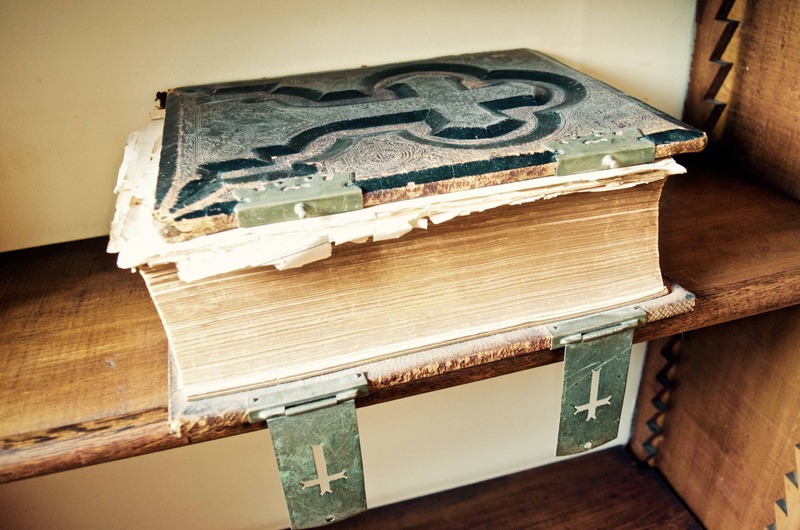 Or this ancient Bible with metal hinges still in tact! This by far was my favorite photo! 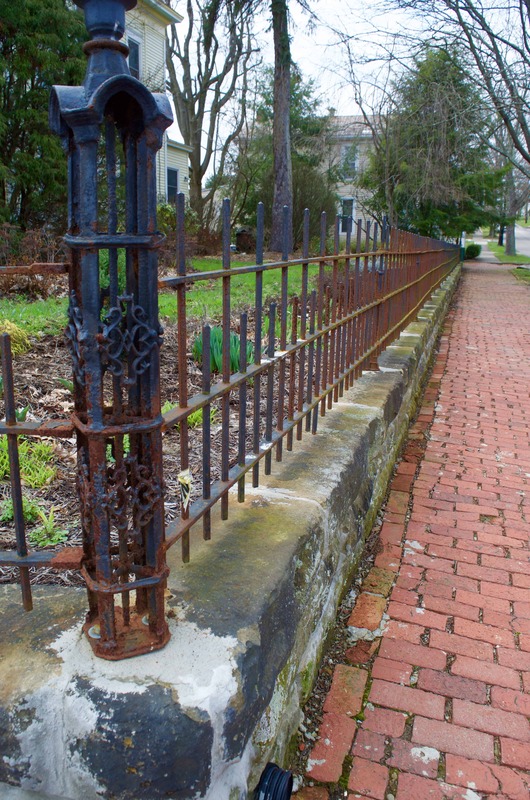 Surrounding the estate you’ll find a lovely cast iron fence next to the old brick sidewalk. 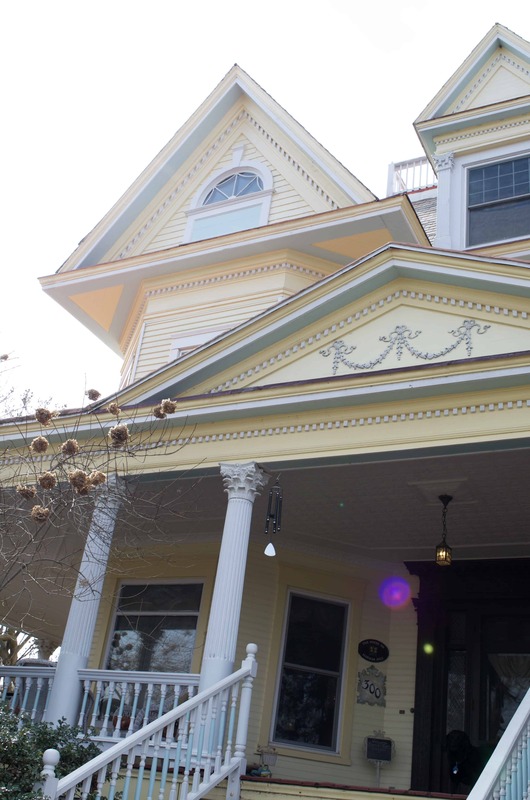 Book a room now at The House on Harmar Hill! 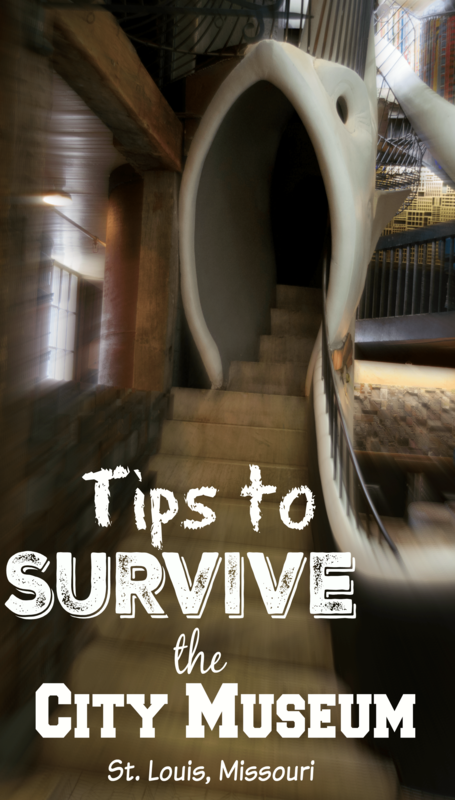 Don’t forget to check out our first post packed with tips to see the Mortuary Museum, a haunted brothel, an old steamboat, a fort inside of a building, an old sanatorium and so much more! 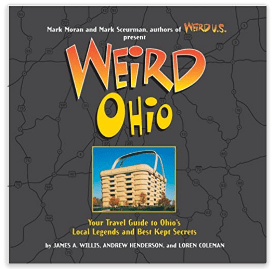 Below are a few great books on the history of Marietta and other fun quirks in Ohio! 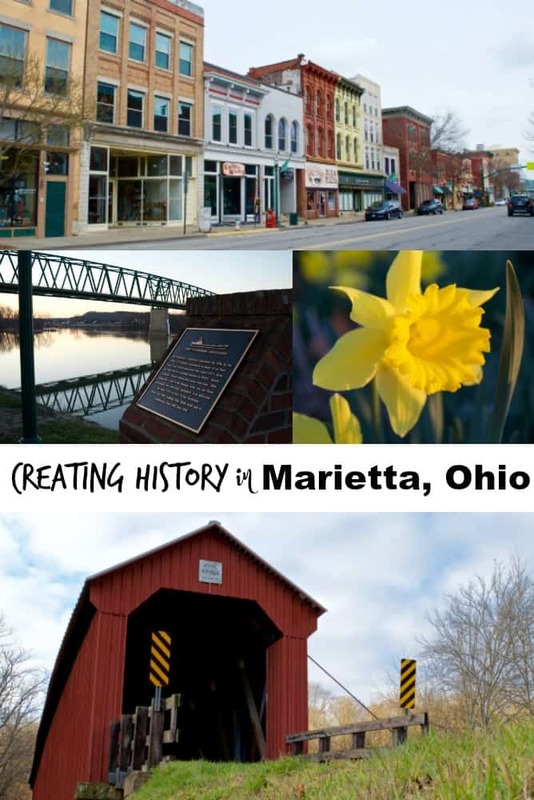 Incredible History Captured and Created RIGHT NOW in Marietta, Ohio! 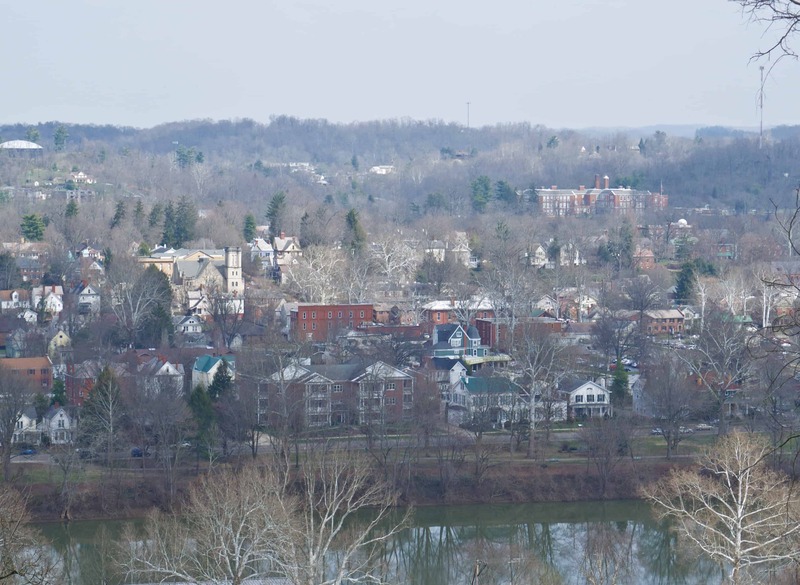 I struggled with what to title this post because quite frankly there is SO much to explore and learn about in Marietta, Ohio! It’s SO much more than just history in the past – the community there is making history RIGHT NOW! After spending 3 days there on a press trip as a guest of the Marietta-Washington County CVB, I saw not only a town firmly (and literally!) standing on a rich amazing history – but Marietta is a talented culture of art, resilience, and storytelling! Everyone I met had a story to tell and it was absolutely incredible. The town was started in 1788 and is not only the oldest town in Ohio but the oldest in the Northwest Territories as well! It was named for Marie Antoinette and each year they hold a festival on the weekend near her birthday. I couldn’t possibly share with you all that I did in just a 3 day period so I will be featuring several aspects of the town in different posts. I can’t even begin to tell you everything I learned here about the above fortification built in 1788 in Marietta, Ohio (the FIRST organized American settlement in the Northwest Territory!). 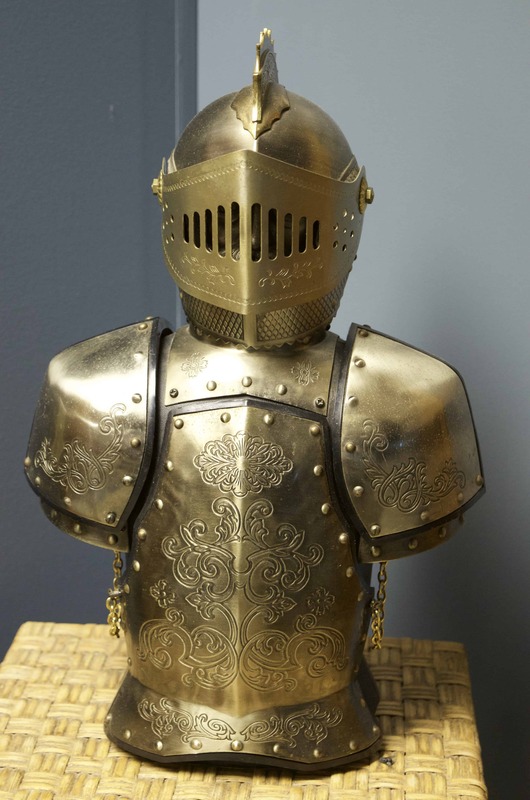 I did find a blog post with some pretty extensive history featured here in the Campus Martius Museum where the largest historical artifact by the Friends of Marietta is safely kept. On site is also the restored Rufus Putnam house as well as the Ohio Company’s Land Office built in 1788! 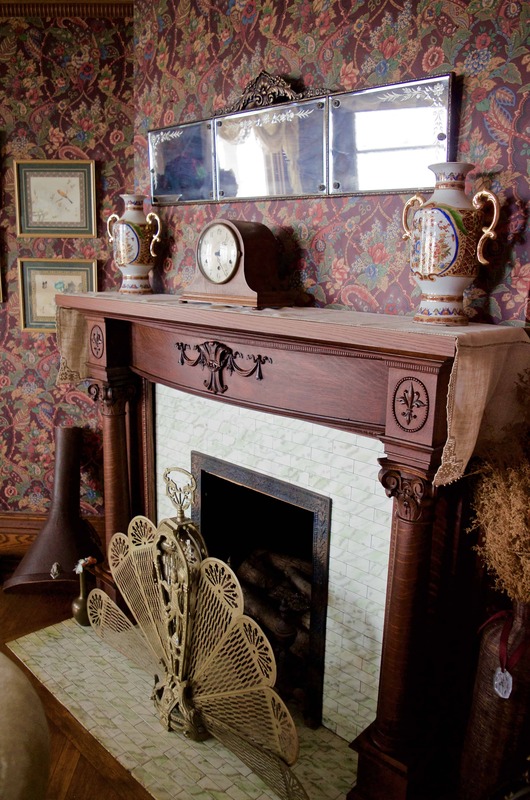 The museum boasts tremendous displays of historical artifacts from the area, war guns, and an entire wing dedicated to the fascinating Lilly Martin Spencer. Lilly’s life is an amazing story of a woman who sold paintings to support her family in the late 1800’s. 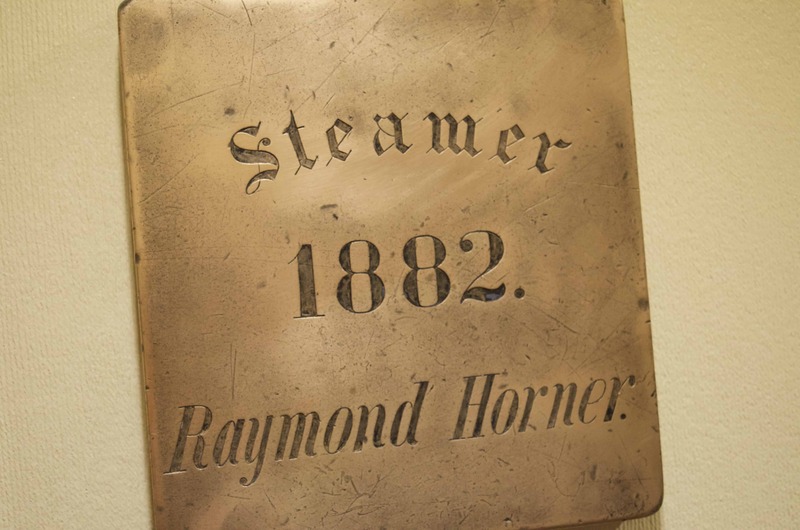 The next largest artifact in Mariett’s historical collection is the W. P. SNYDER JR. – the last intact steam-powered stern-wheeled boat in the US. 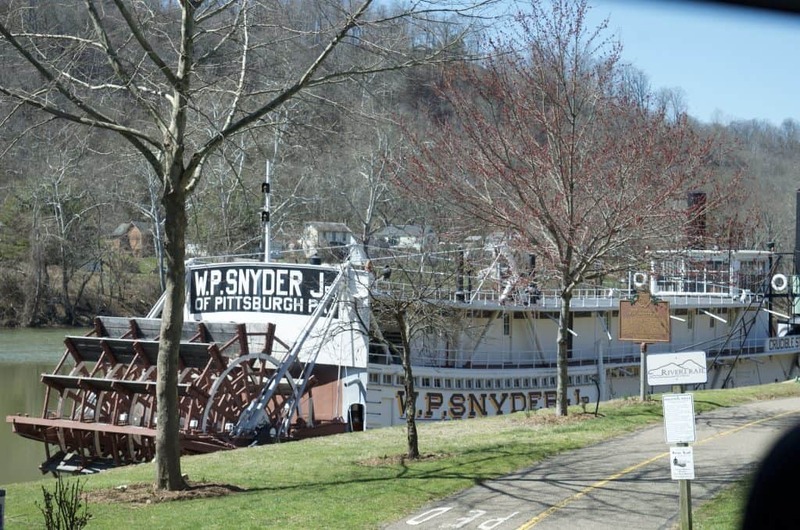 It’s located just outside the Ohio River Museum and can be toured during the warmer months. Upon our arrival in Marietta we took a walking tour with Hidden Marietta and I can’t recommend this enough! 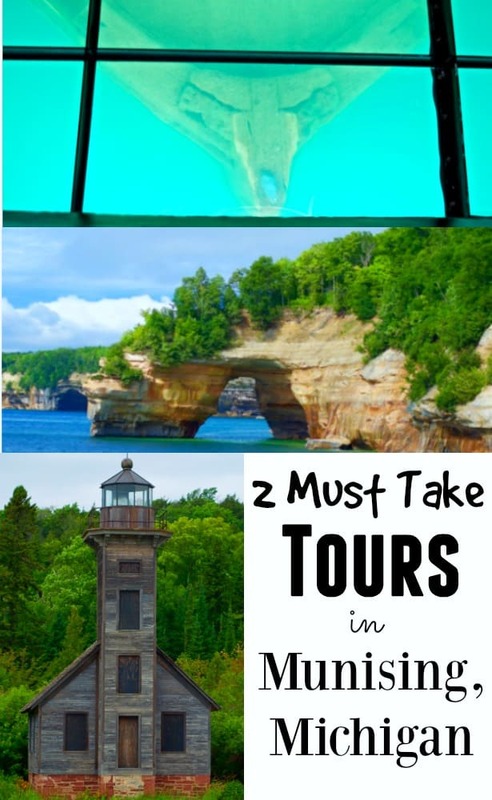 In fact they have several tours and I HIGHLY recommend all of them! You will learn SO much about the history (and the ghosts!) in Marietta. It’s a spooky delight and a fascinating story woven by era-dressed tour guides. One ghastly stop was here at the current The Levee House Restaurant. This fine dining establishment is packed with character as it is the very last original riverfront structure here in town. But in the early 1800’s this waterfront district had it’s darker history brewing. If you enjoy living on the spookier side of life you can read about the sordid tale of this formal brothel here. This eerie spot on our Hidden Marietta tour also left me with the desire to explore the insides of the building! If you look very closely you can see the ghost writing with the words: ” Chronic Disease Sanitarium”. 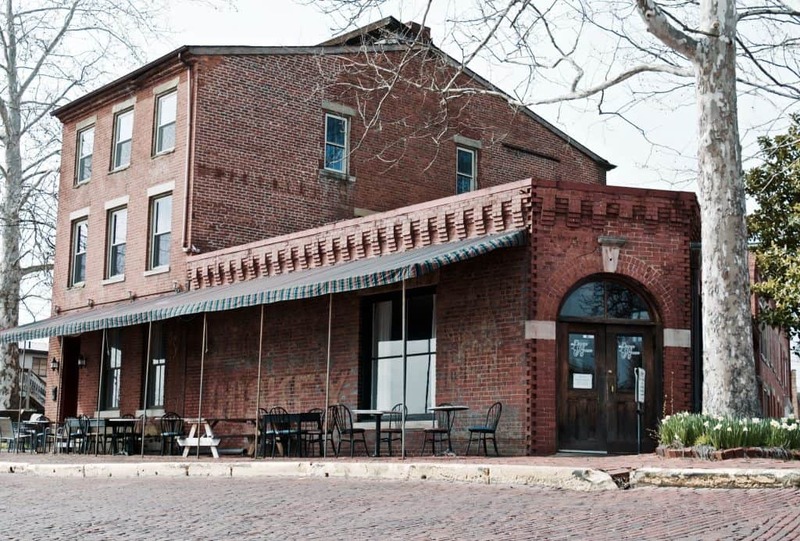 It was a hospital in the early 1900’s, then a funeral parlor, and is now attached to what is known as the Tiber Way Grille – a popular hot spot for locals. The entire building is a curved and built so that the railroad could go around it. 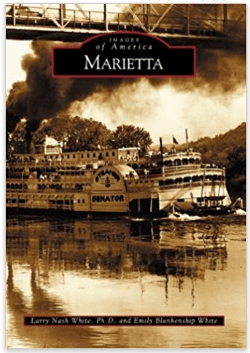 Yet another intriguing bit of history is that Marietta is a mecca for floods and fires. OK – maybe not something you would normally be proud of but in Marietta it is equivalent to resilience and determination. As you walk through town you can actually find markers displayed of how high various flood waters were. In fact in the past 100 years Marietta has had 20 major floods! Let that sink in for a minute! In fact the town itself used to be built down lower until it kept flooding so much they made the bold decision to basically pave over the town and build a new town right on top! SAY WHAT?! Yep! You can still see evidence of this like the building in the photo above where you can still see the tops of the old windows buried underneath the city. Insanely incredible! For the sake of turning this into information overload there is one more incredible place with a colorful history that is absolutely captivating. So captivating in fact that I want to head back to Marietta some day to explore it! See that island on the right side of the above photo past the bridge? 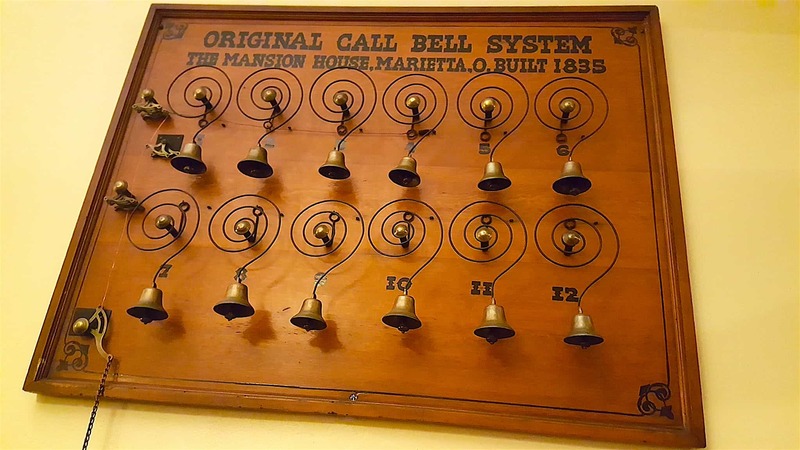 Ask around town and you may here different versions of the story but if you take the Hidden Marietta walking tours you’ll hear about this fascinating spot. 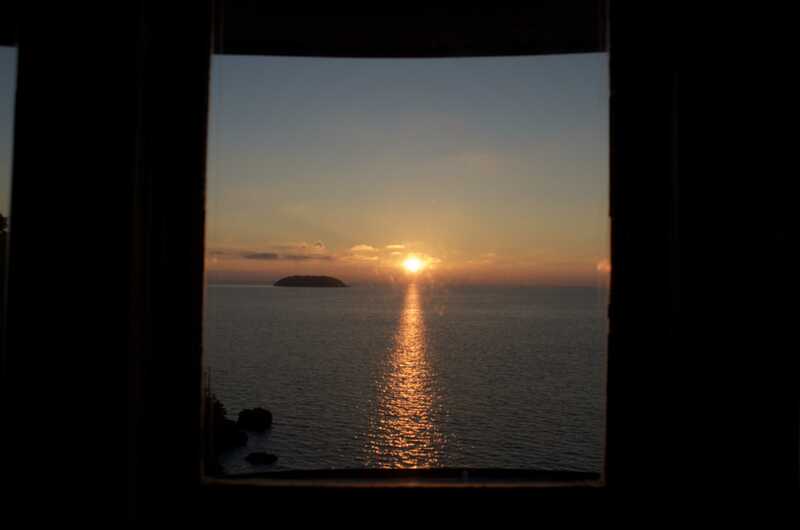 This little island has been a farm, a carnival, a hideout for outlaws, a place for gambling, and anything else you can imagine – and sometimes all at the same time! It seems each time a flood washes it away it becomes something new again! It’s pretty incredible and I’ve heard you can still find remains of its historical past on the island if you look close enough. 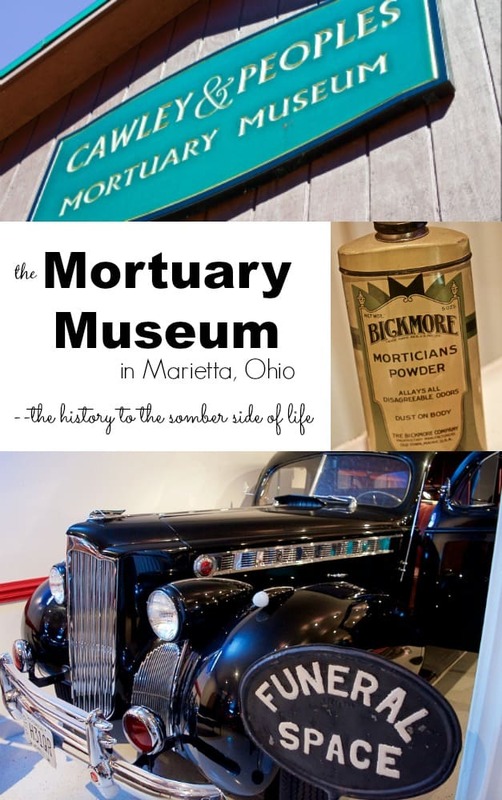 The Peoples Mortuary Museum in Marietta is a private collection of antique hearses and other funeral / embalming related equipment. 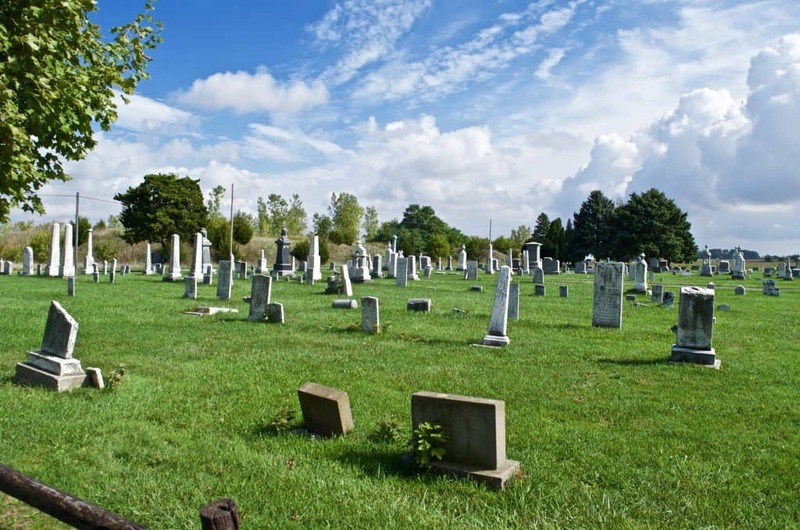 It is located – you guessed it – right next to a funeral parlor and although admission is FREE please make sure to call ahead to the funeral home and they can set you up a time to come by! This sizeable museum is astonishing and well kept and includes a large collection of hearses (some used in Hollywood films! ), photos from past death portraits, antique coffins of various types, and ALL sorts of related artifacts. 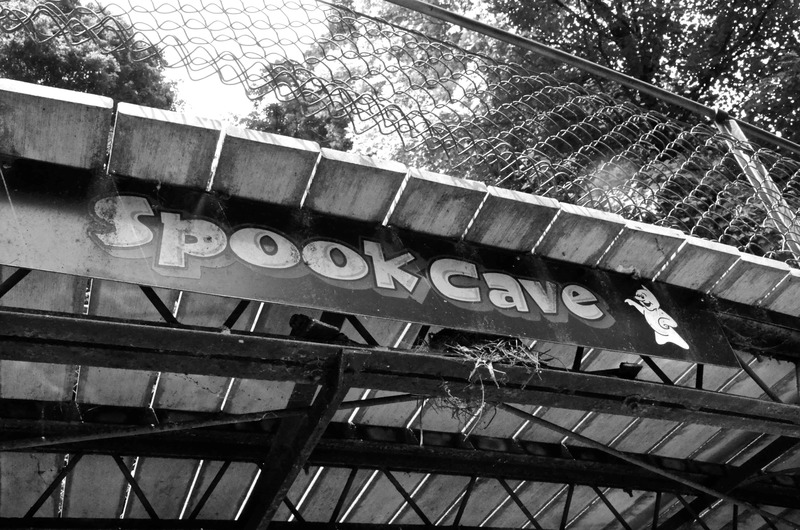 It is not gruesome or spooky at all and is quite the interesting educational stop! 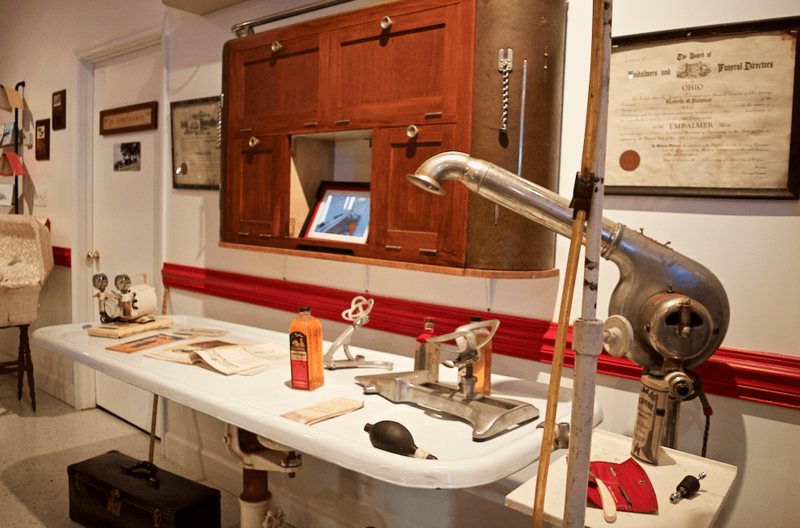 Personally I am fascinated by previous medical antiquities and appreciated the opportunity to walk through this private museum. Inside of the Mound Cemetery you’ll find this Earthworks Mound where you can climb to the top and ponder the people that lived here long ago. 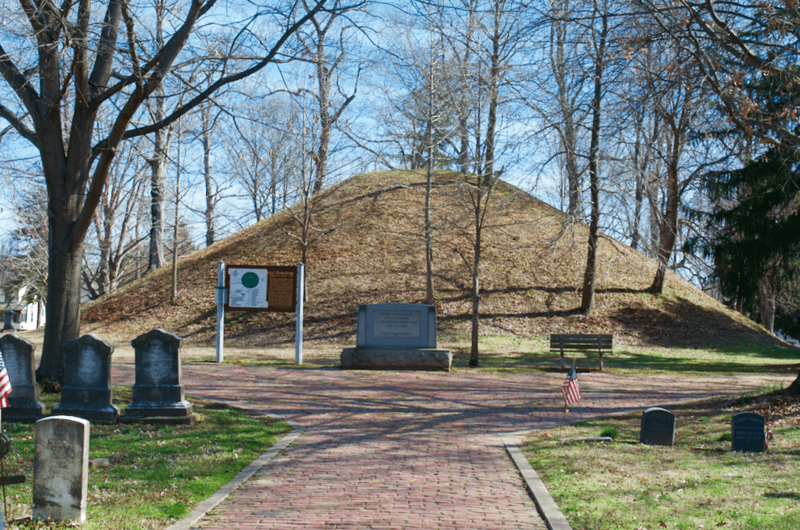 This is one of the earliest known mounds in our country and you can actually find several still preserved locations throughout town. The cemetery itself is one of the oldest in the region and not only are there soldiers from many different American wars buried there but it is home to the largest number of Revolutionary soldiers buried in one place anywhere! Sewah Studios makes more than 75% of the historical markers in our country and high chances are, you’ve come across at least one! They are all COMPLETELY hand made works of art! Can you believe that?! It’s an incredible process started in 1927 by Mr. E. M. Hawes (his last name is Sewah spelled backwards!) 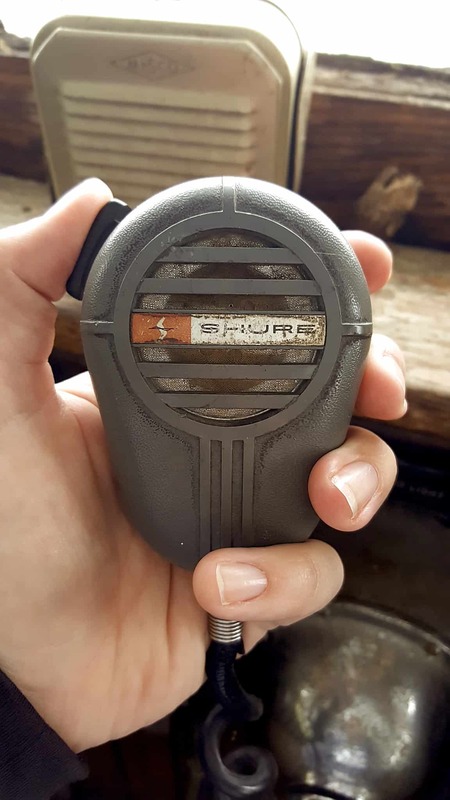 It was bought in the 50’s by the grandfather of the same man running the company right now! 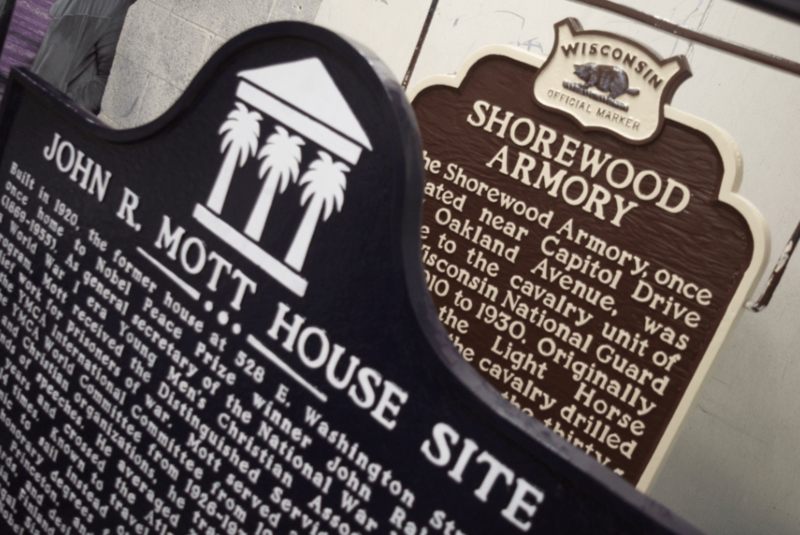 They make over 1200 markers each year and claim the trendy title of “History on a Stick”. 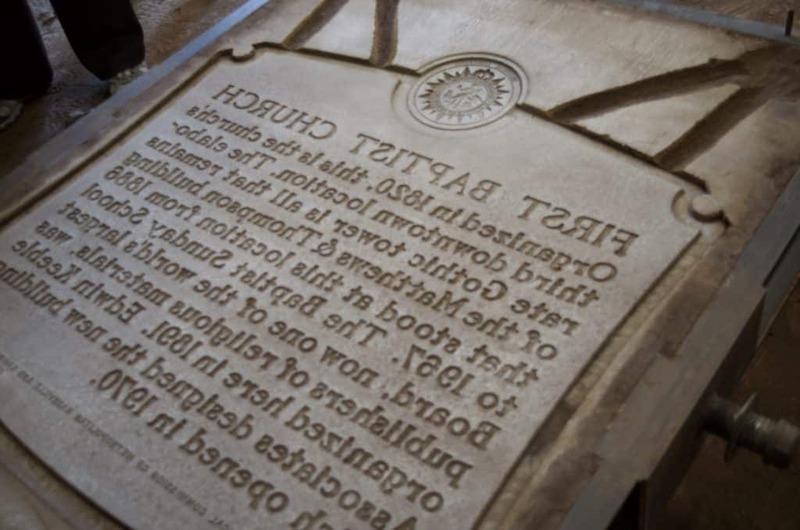 Their markers can be found in every state in the US and they create the official state markers for 26 of our US states. You can see photos and details of their step by step process here but I recommend watching the video below too! 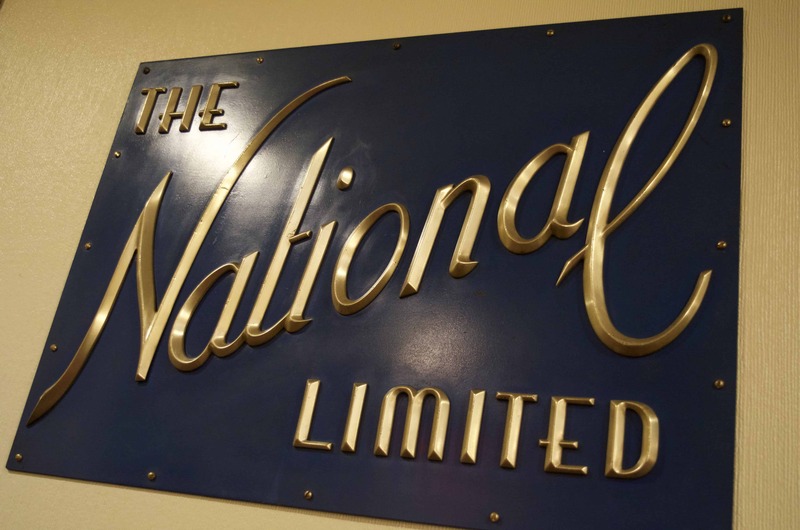 With NO sales team and NO advertising they clear over $2 MILLION each year with their handmade markers – and it’s pretty incredible! I took a TON of photos from my tour in Sewah Studios but couldn’t possibly post them all here! Below are a few to give you an overview of the walk through. The first room I walked through was piled floor to ceiling with letters of all shapes and sizes which are used to create the descriptions on the signs! They are pre-laid out for accuracy and spaced. 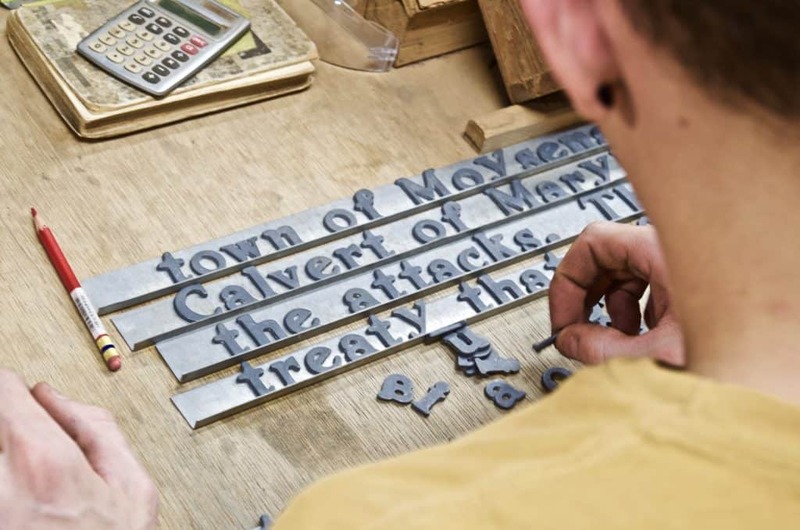 Once they have the letters all laid out and a template built they create a sand casting of it. Above is literally just a pile of packed down sand with the template pressed into it! Isn’t it incredible?! The sand used comes straight from the Ohio River nearby which is awesome! 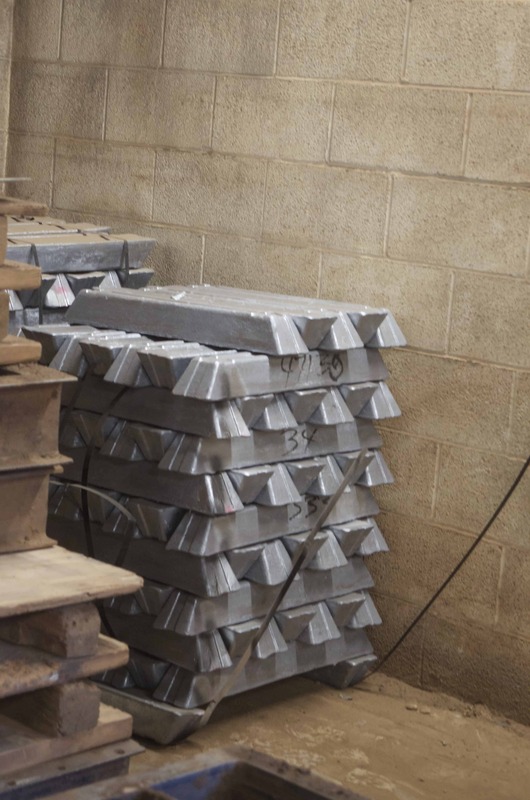 Once the template is casted into the sand these gigantic bars of aluminum are melted right on site. 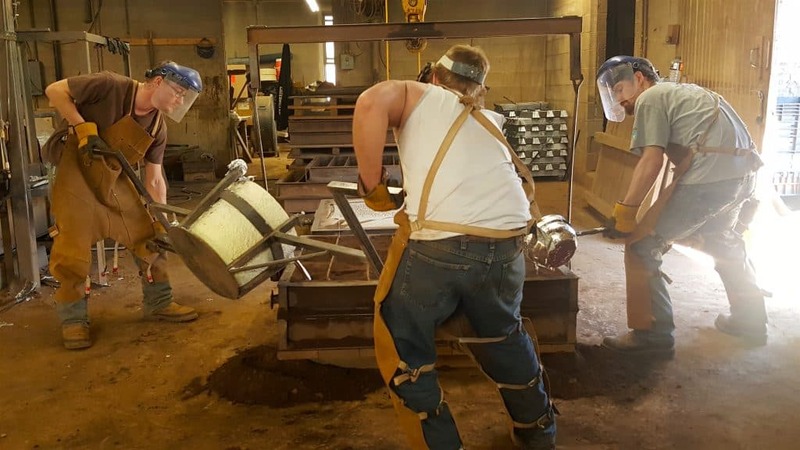 Surprisingly it doesn’t take long to melt the ingots and the hot liquid aluminum is transferred into a bucket and then poured right into the sand casted template! 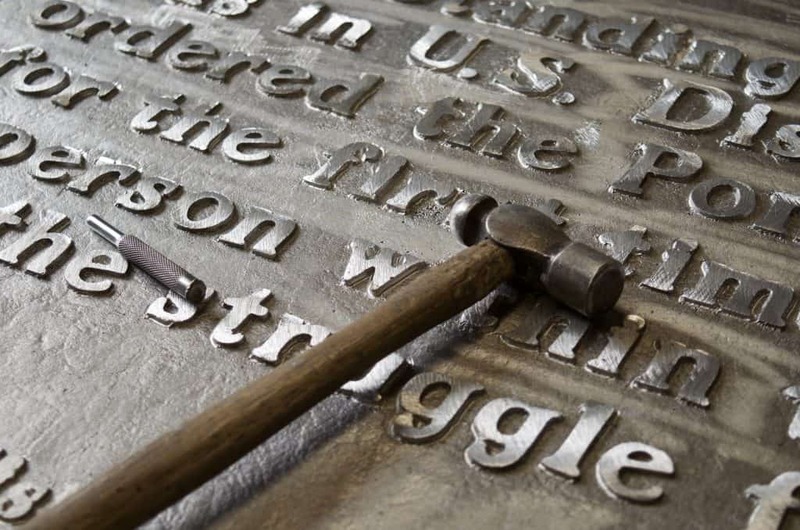 This is the cast once it has been removed and cleaned – can you believe it?! Just from pouring hot aluminum liquid into a pile of sand. OK so it’s a little more complicated than that and is a meticulous process but you get the gist! 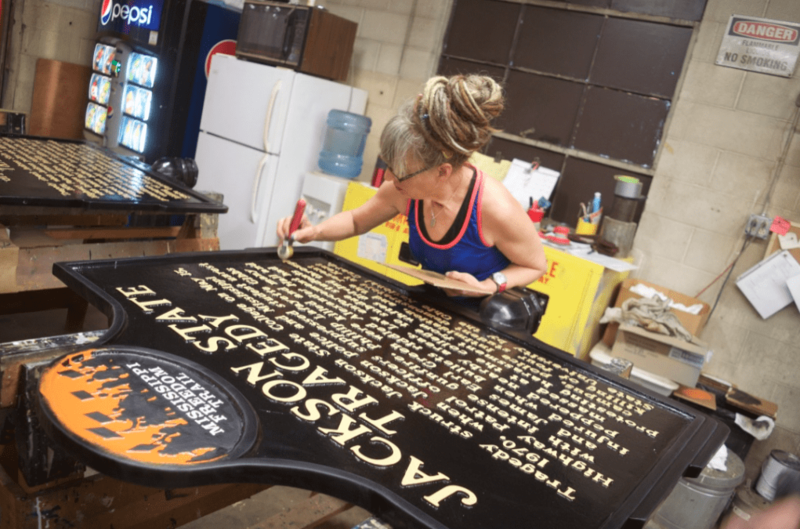 After baking and drying base coats of paint onto the historical markers the letters and designs are then hand painted on! Can you imagine accidentally messing up any part of this process on these signs!? The prices start at about $1000+ so that would be a pretty pricey mistake! It’s really a phenomenal process and amazing that most of us have seen these signs and knew nothing about them! A special thank you to the Marietta-Washington County CVB for inviting me to tour the area and hosting my stay. 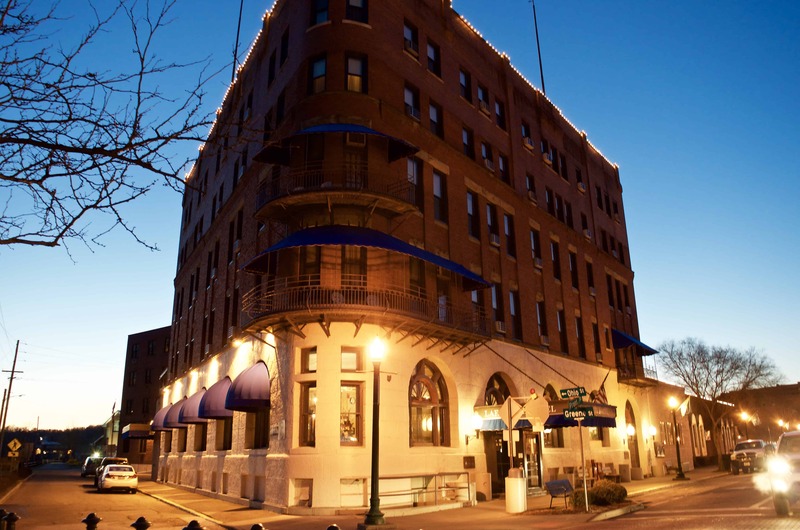 If you’re planning a visit I recommend staying in the Historic Lafayette Hotel – it’s right on the water next to fabulous boutique shops and provides a wonderful experience! 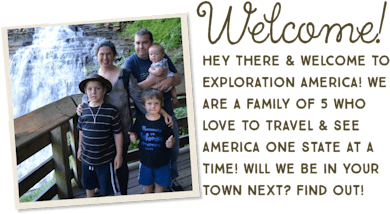 Maybe you LOVE exploring caves like I do, or maybe you’ve come across Seneca Caverns in Bellevue, Ohio and are looking for an adventure you’ve never done before. 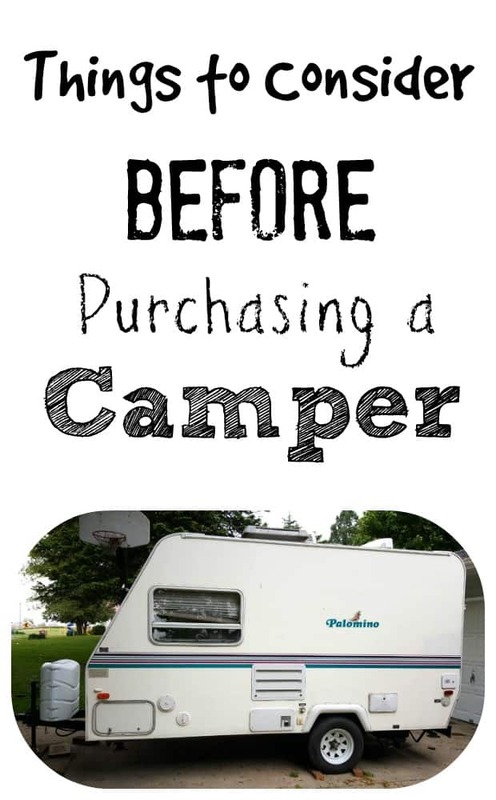 Either way – you’ll want to read this post first! The outside looks like what you might expect out in the country farm fields in the Midwest. (which is not very much!) In fact as I drove out there on the dirt roads I thought perhaps my GPS had taken me to a wrong location! 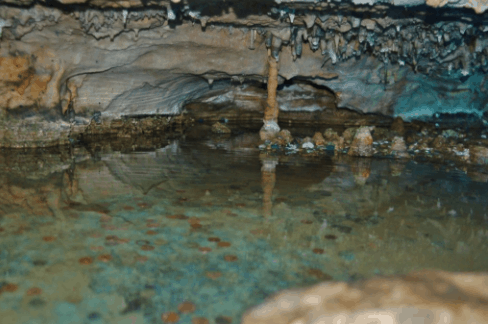 As I drove down the road I did see the Seneca Caverns sign right away…..but the strangest thing was that there was a cemetery literally RIGHT next to the Seneca Caverns parking lot. That fence you see in the bottom left – that’s right where my car is pulled up on in the parking lot! 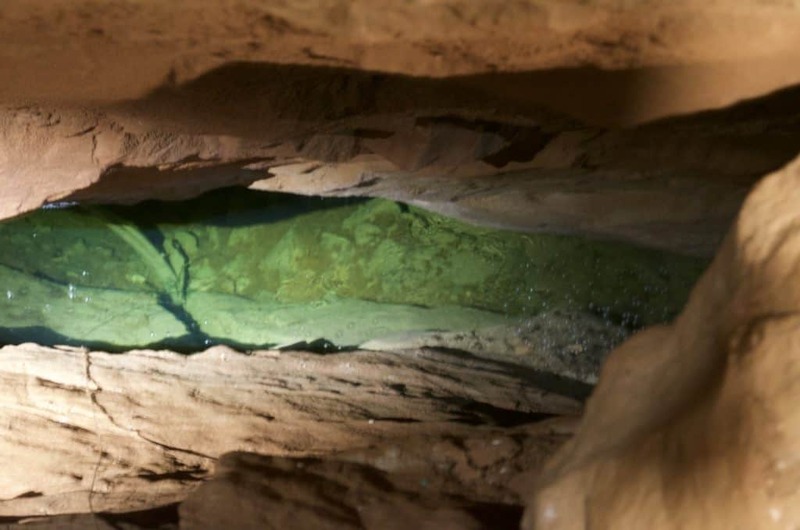 I’ve been to over 30 caves in the USA and I’ve never seen such a location. It definitely intrigued me. Nothing about this experience was anything at all like any of the other caves I’ve been in – and I’ve been in A LOT! 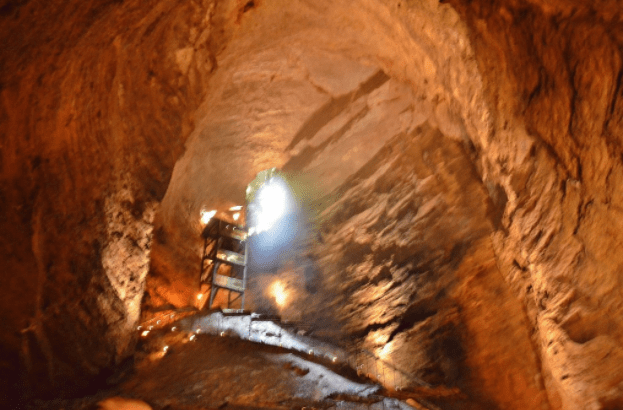 How Difficult is Seneca Caverns to Explore? 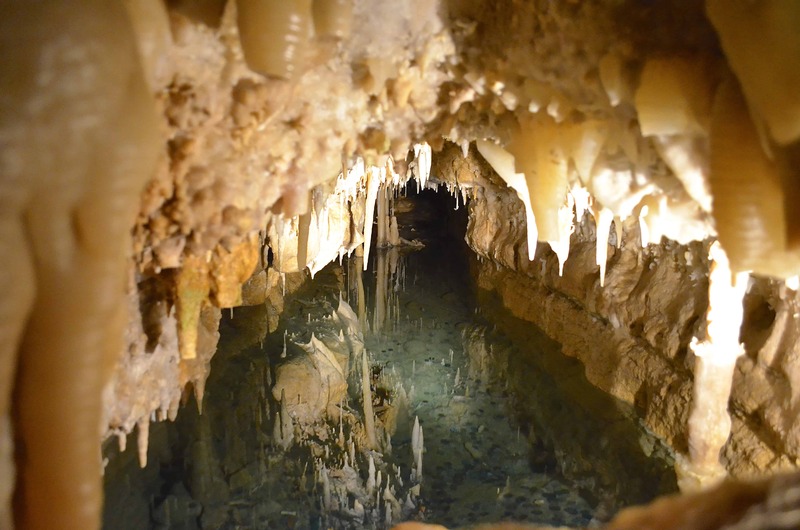 Seneca Caverns boasts itself as “the caviest cave in the USA” – gosh darn it I’d totally agree! 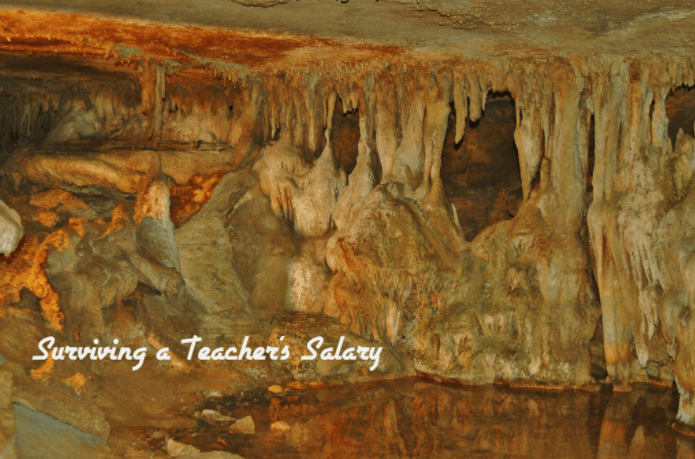 I’ve been in some pretty intense cave tours but this one wins hands down – it’s hard as heck! It’s very tight, extremely steep, and involves a lot of climbing. I personally do NOT recommend it for kids under 6 at all, and I definitely don’t recommend it for anyone who isn’t in very good physical condition. If you do bring young kids expect to need to pass them down the “steps” and take great caution near the drop offs. This is not an adventure your grandma will likely want to join in on! 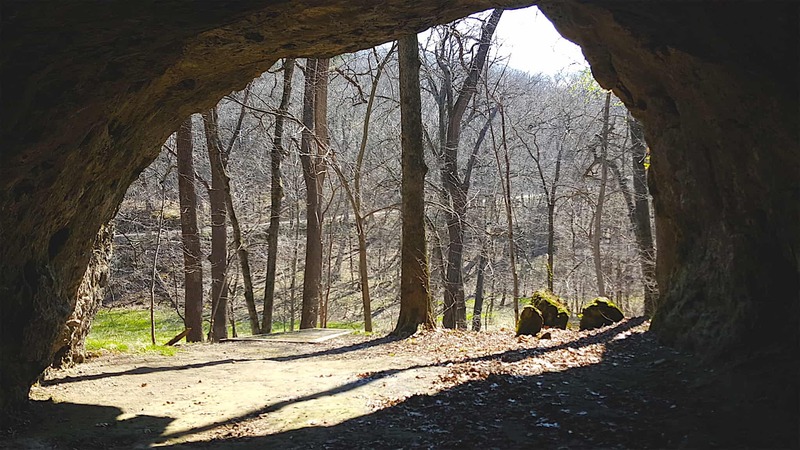 In fact I’ve taken my daughter to more than 10 caves before she turned 2 years old and I would not bring her to Seneca Caverns. For several reasons which you’ll read below. Before you enter the caverns you’ll see a great map of the different levels of the cave. 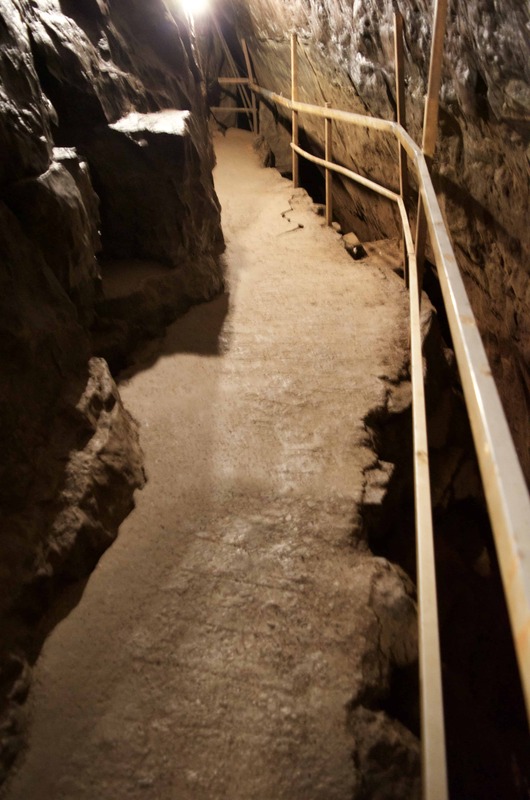 During the tour you’ll actually be able to see the water table – that’s how far down you go! Not only is it steep but the entire way down is via tight switchbacks where you will have to climb down rocks to get to the next level. I had worked up quite a sweat by the end of the tour! I’m just glad the lady behind me didn’t pass out as she had quite a bit of difficulty during this tour! 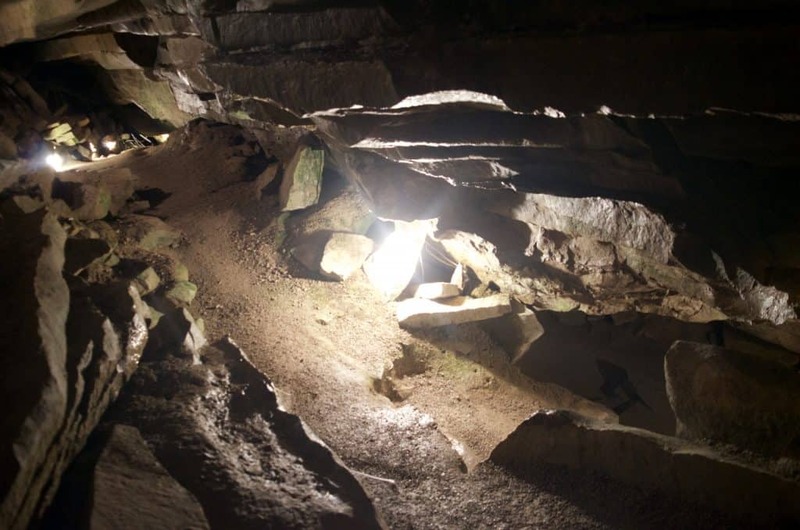 Is Seneca Caverns Safe for Kids? Our tour guide was fantastic and I was shocked at the size of our group! For the caverns being located in the middle of nowhere I definitely found it extremely busy the day I went! You can see above the pathway is narrow – there’s quite a drop off! I wouldn’t want my young kids in this cave and I’m pretty adventurous. I even had to walk through a cave while nursing my baby once! If I haven’t scared you off yet it’s definitely worth stopping in if you’re up for a challenge! I have a bit of a cave obsession so I can’t turn down the chance to tour a cave I’ve never been in! I was totally enamored with this cave and it’s truly unique formation although I’m a little hesitant to go again simply because of the physical strain. There’s even a ceiling in this cave with tons of fossils embedded which I have not come across before on a cave tour so that was pretty cool. I know this post seems like it comes with a rather dire warning but I’d rather you know what you’re up for before you go! 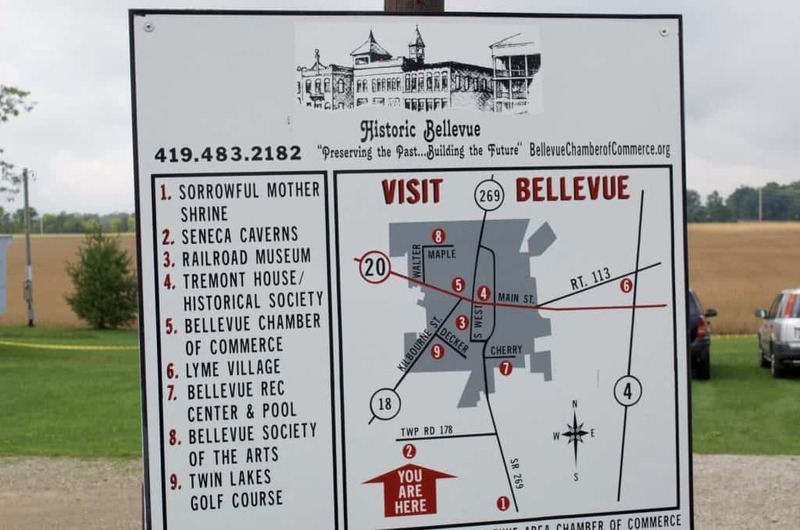 Outside of the caverns is a map of historic Bellevue if you’re looking for something else close by in the area to do! I took a ton of photos while I was on the tour but honestly it was so tight and physically straining that I did not get many decent photos! I’m very glad that I went and experienced it. We’ll certainly stop by again if we find ourselves in the area. 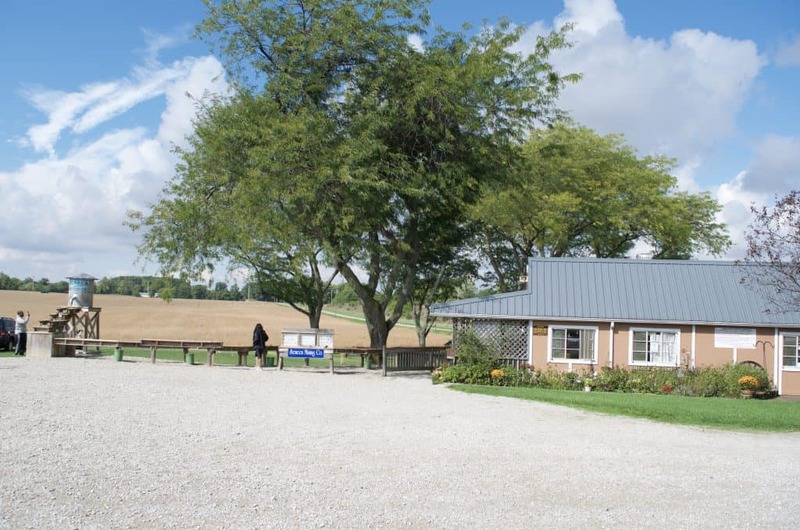 But first, make sure you start at the visitor’s center which is across the field from the monument. The park ranger we met there was insanely awesome and when he talked it really felt like he was there at the battle! He was SO passionate about the history. 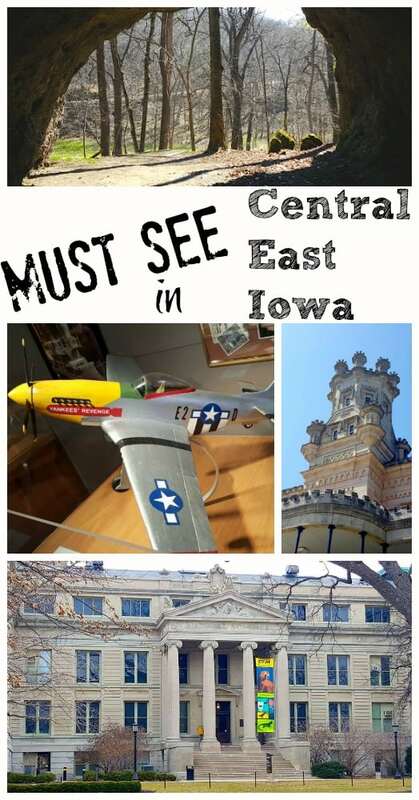 You’ll find stunning artwork, museum quality displays, and a small gift shop. 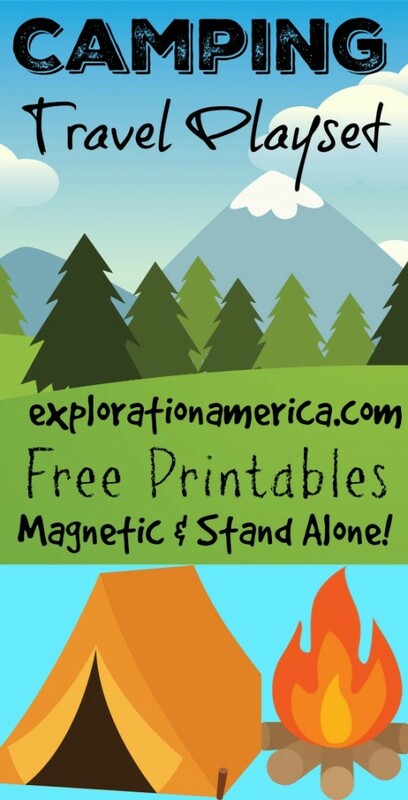 This is also where kids can pick up their Junior Ranger booklet. 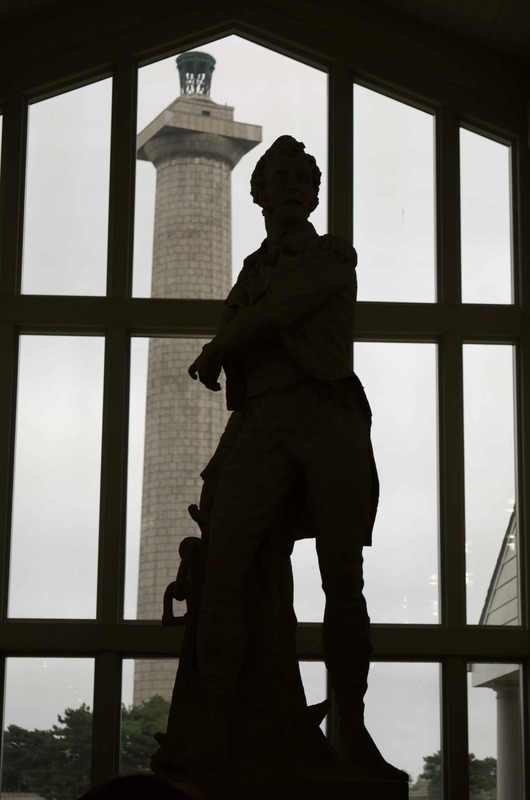 Don’t forget to ask the park ranger there about the statue – you can’t miss it and you’ll be glad you asked! 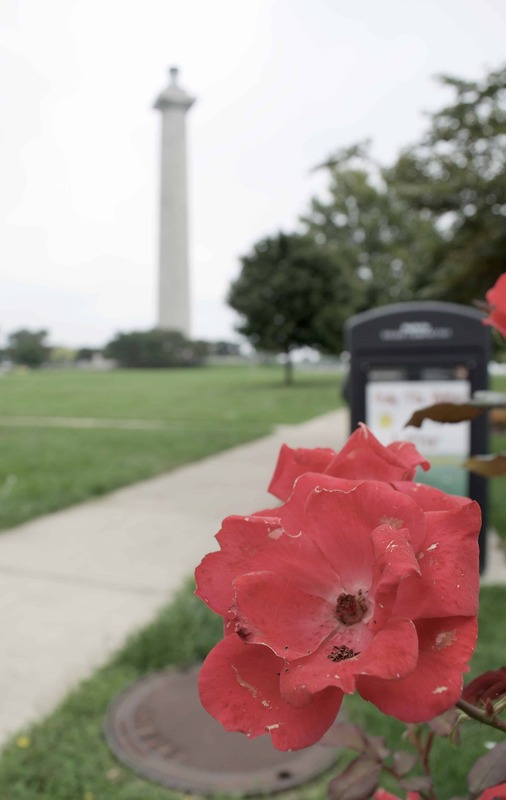 It’s a short walk from the park service building over to the monument but you’ll want to visit on a nice day! 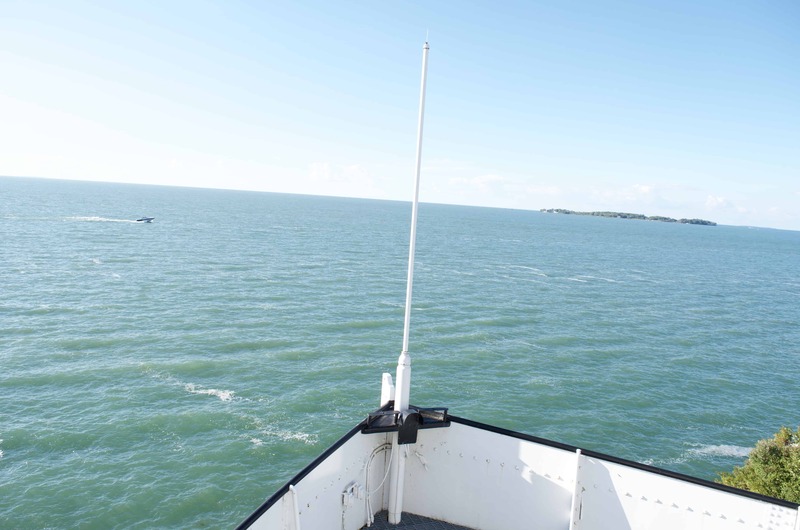 It’s a gorgeous view off of Lake Eerie – that’s for sure! 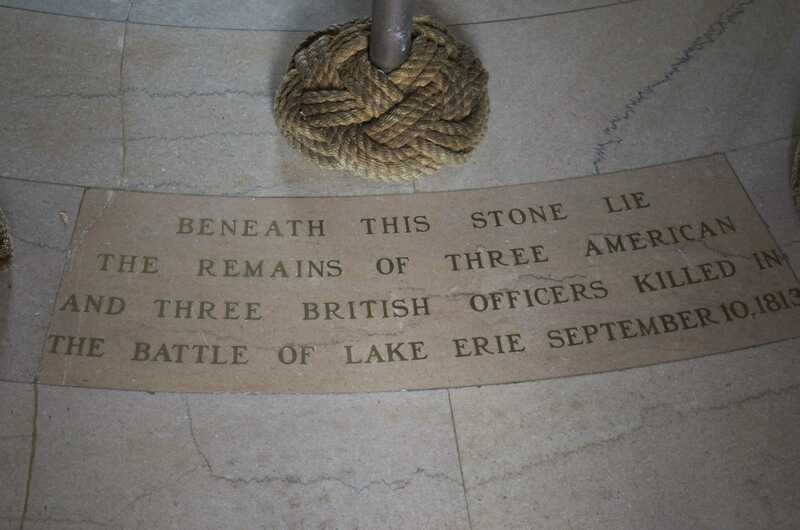 Immediately upon entering Perry’s Monument you’ll see that the remains of 6 soldiers are buried beneath the stone. 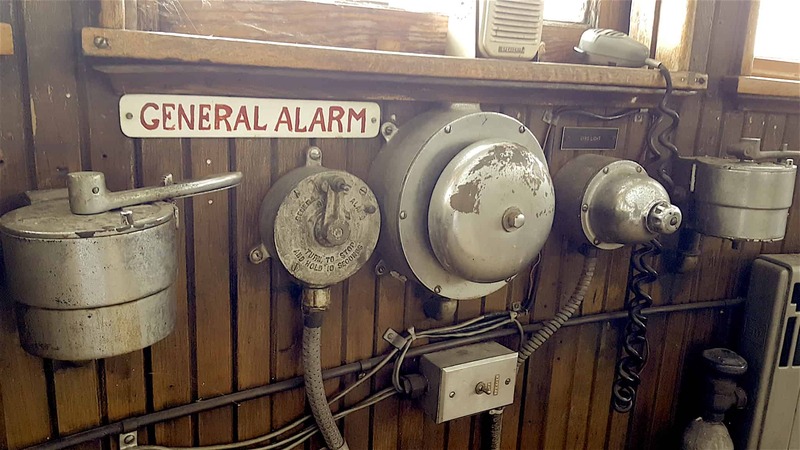 After hearing a bit about the history from the park ranger you’ll ride an elevator up to the observation deck. Don’t get so distracted by the awesome view (you can look out over the entire island as well as neighboring islands and even Canada!) that you don’t look UP! Seriously – LOOK UP! 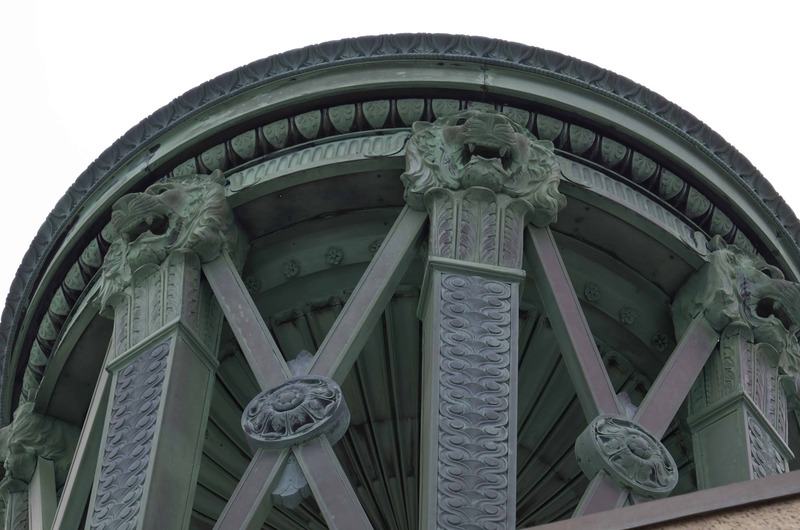 The architectural work on the urn at the top of the monument is fantastic. 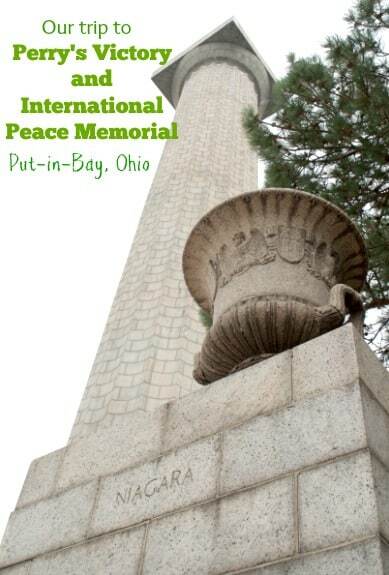 And if you want to see the monument from a stunning spot go to the other side of the island at Oak Park State Park (Ohio’s smallest state park and only 1.5 acres small!). It’s a fantastic spot for a picnic or a romantic evening. You can even access the water via boat here. 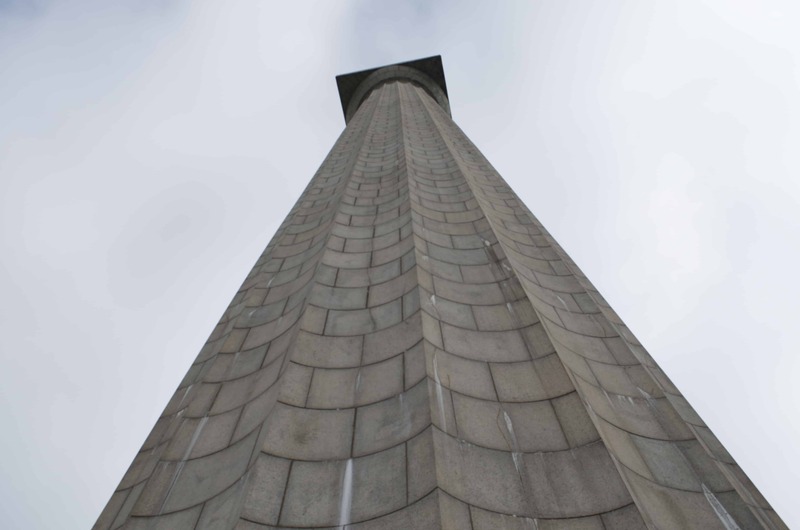 If you are hoping to visit Perry’s Monument please make sure you double check if the observation deck and visitor’s center are open. They are closed for the winter although the grounds are open. Recently I attended the Travel Influencer workshop hosted on a unique ship house with the fabulous ladies from Social Influencer Media, LLC. Through this I was offered the incredibly awesome and completely exclusive opportunity to spend a few days on the history Benson Ford Ship House in Put-in-Bay, Ohio. First of all – you need to know it is AWESOME. But secondly (and most importantly!) it is a PRIVATE residence and is NOT available for rent or tours! So please don’t try contacting the owners! 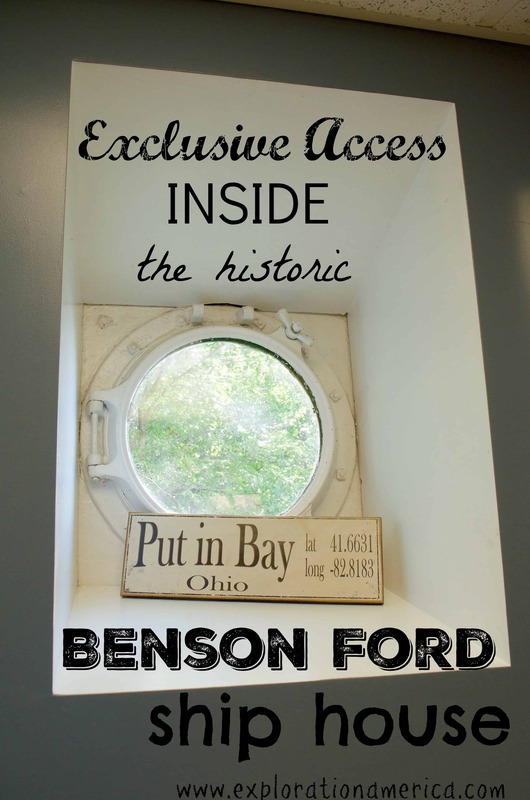 On the bright side, however, I took plenty of photos to share with you a little bit not only about the interesting history of the Benson Ford but also a glimpse inside so that you can see what it looks like today. You can find even more history and images here. 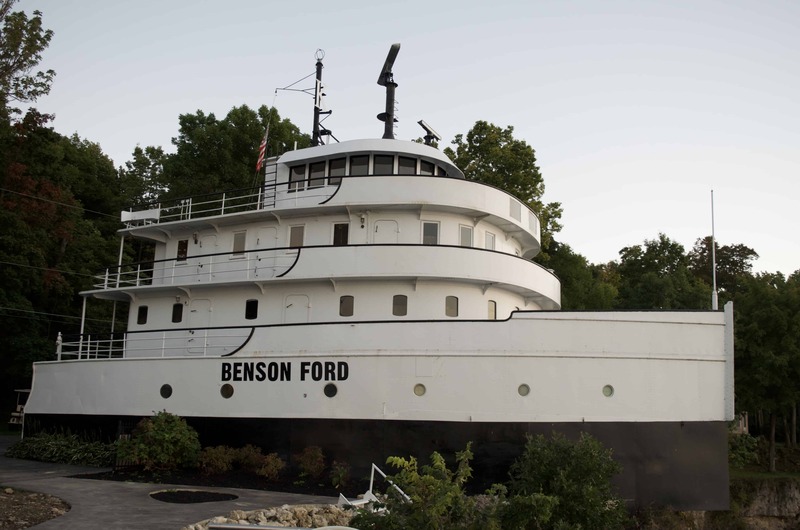 It all started back in 1924 when the Benson Ford ship (named for one of Henry Ford’s grandsons) was built and launched for the Ford Motor Company. 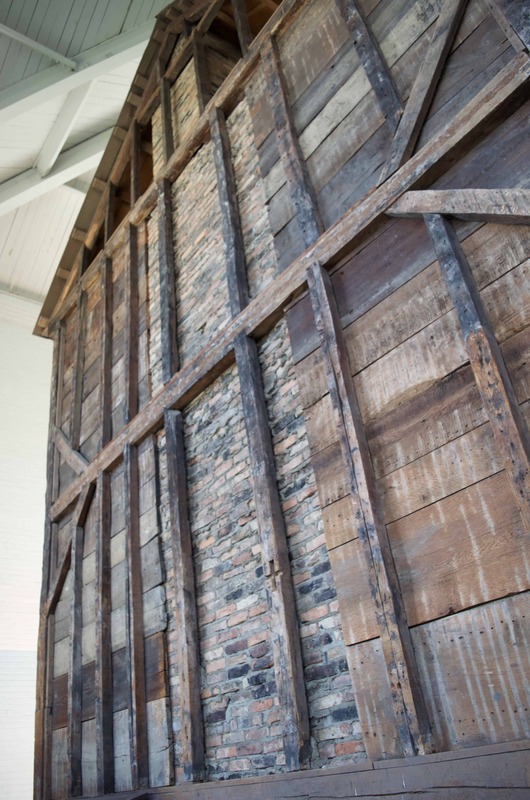 It was designed and used for transporting iron ore and other materials across the Great Lakes. Twice in 1959 it ran aground. It was then sold in 1981 to Frank J. Sullivan, renamed John Dykstra II, after being stripped for salvageable parts. Mr. Sullivan intended to use it as a barge but it never sailed again. In 1992 decided to try and turn into a bed & breakfast. When licensing couldn’t be properly acquired it was then resold 5 years later as a private residence. 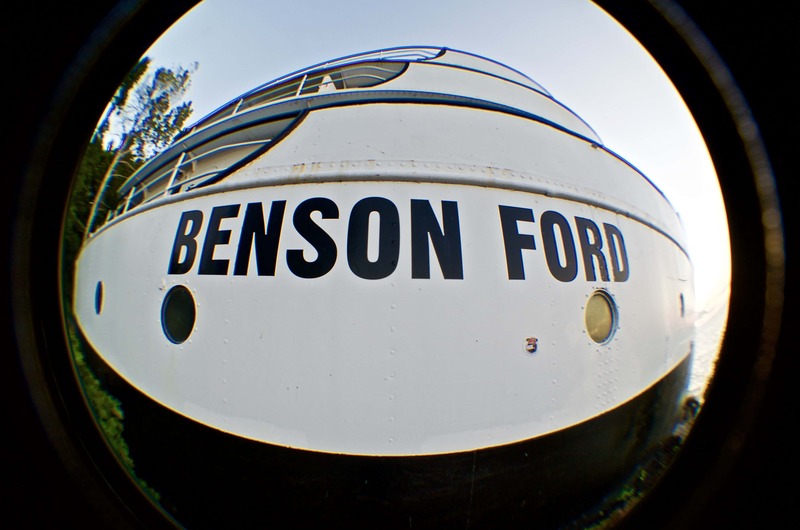 The structure was once again renamed the Benson Ford and renovated to be lived in. This 4 story summer home is a whopping 7000 square feet and includes a garage, family room, 5 bedrooms, 5 full baths, dining room, living room, galley, and one of my favorites – the pilot house! Although the ship house is not visible while on Put-in-Bay as it is a private residence you can catch a glimpse of this amazing piece of history as you approach the island far to the right while on the Miller Ferry which runs multiple times throughout the day and carries not only people but vehicles and other service trucks between the island and the mainland. (although golf carts are still the preferred method of travel on the island – I recommend E’s Put-in-Bay Golf Carts.) You can also see it best perhaps by kayaking on Lake Erie directly in front of the ship house. No matter what angle you see it from it is still stunning. 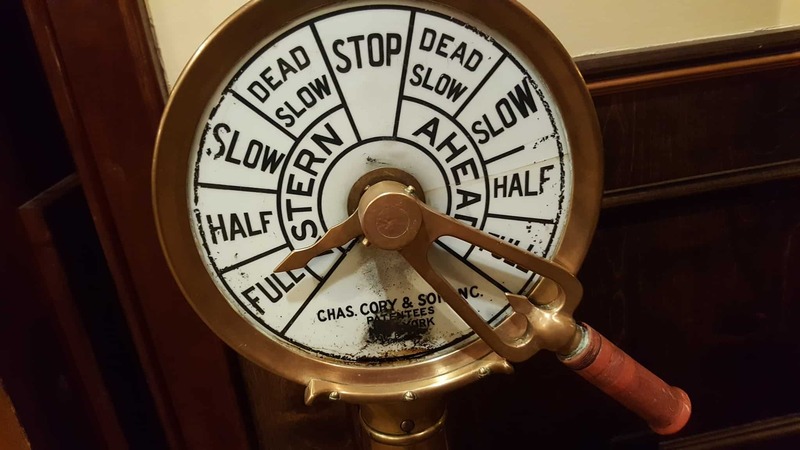 As you tour through the ship it’s such an exciting and unique experience – and handsomely decorated – you tend to forget you’re in a ship. But the steep stairs remind you how difficult it would be to make it from top to bottom in poor weather on the seas! 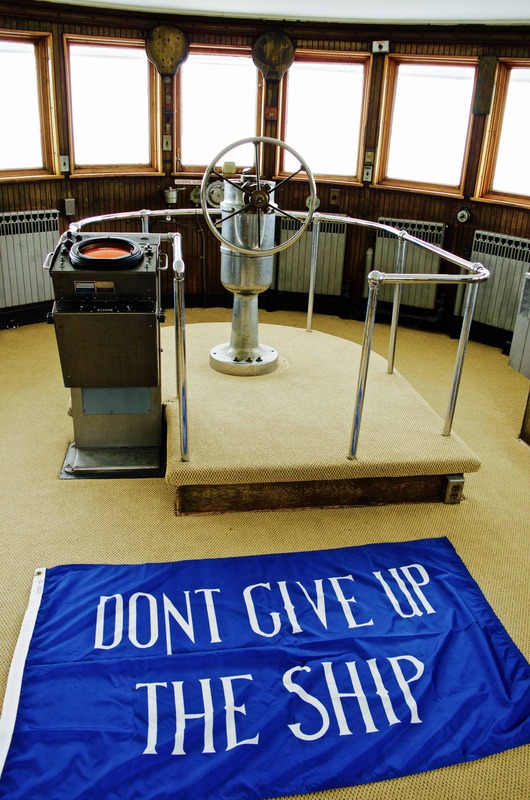 Let’s head up to the pilot house – the most unique location in this house and the highest level indoors. 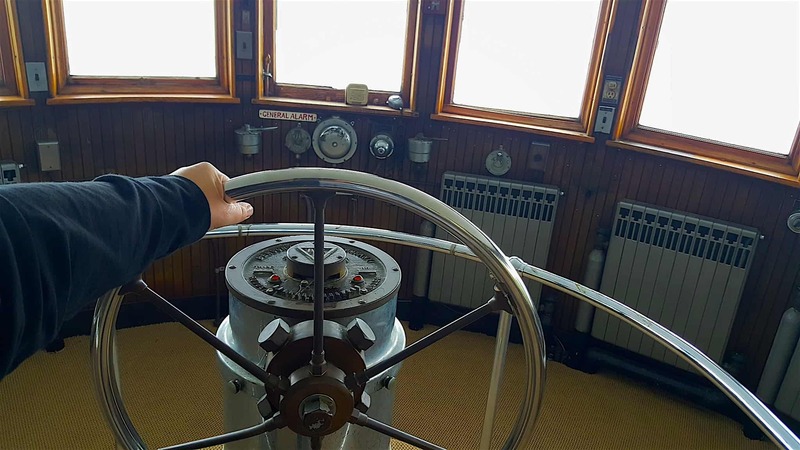 From what I can tell most – if not all – of the pilot house is original. It still has the old equipment, steering wheel and radio system in place. It by far provides the most stunning view from inside the ship. 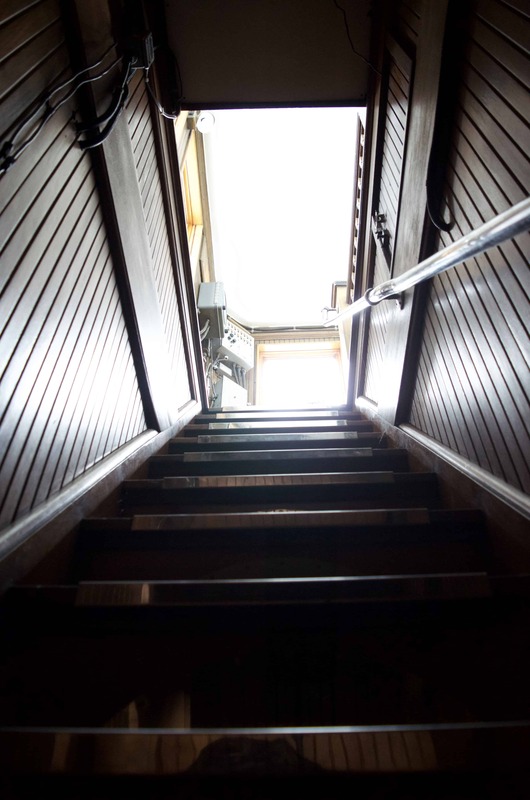 As we head back down to the next level exiting from the steep stairs (which appears to be a secret closet) we find ourselves inside the study. On this floor are 3 of the bedrooms and 2 bathrooms – one of which I slept in. This was the room I slept in – small but cozy. The best part was being able to keep the heavy ship door open at night and listen to the waves crash off of Lake Erie! 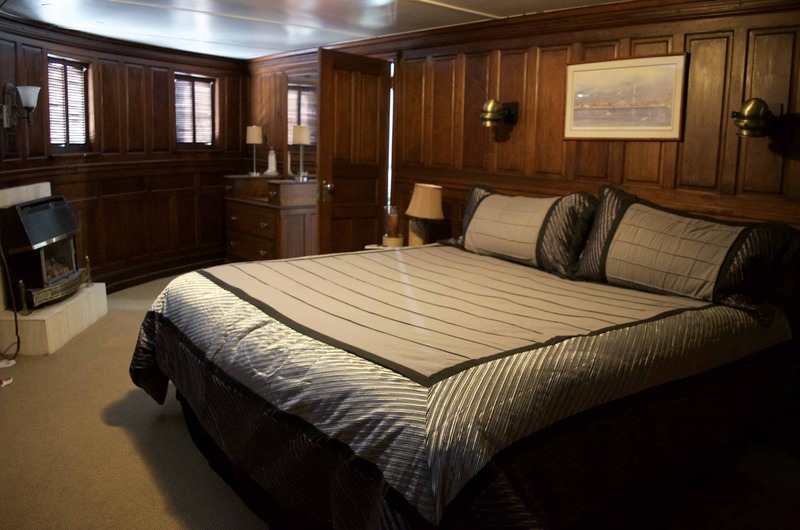 Most of the smaller bedrooms were similar in size and design. 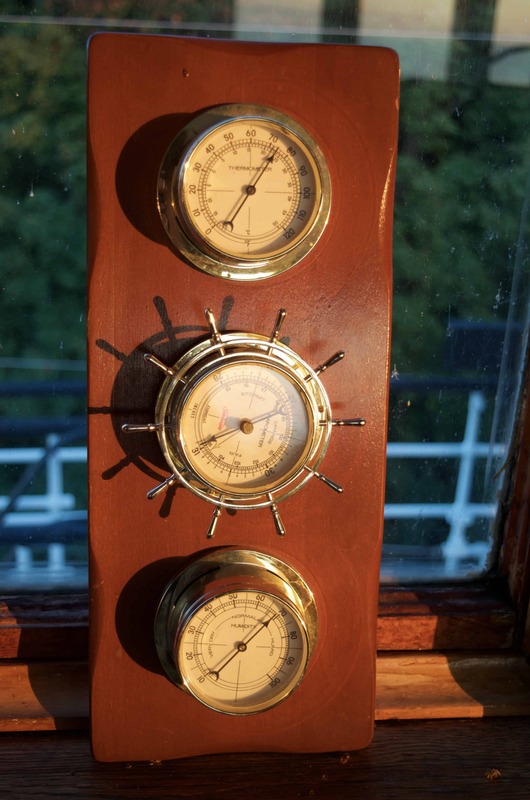 What I love is that the ship house, although a private residence, has kept much of the design and decor original. Sometimes I felt more like I was walking through a museum! Here’s a glimpse into one of the larger bedrooms as we travel down another floor. 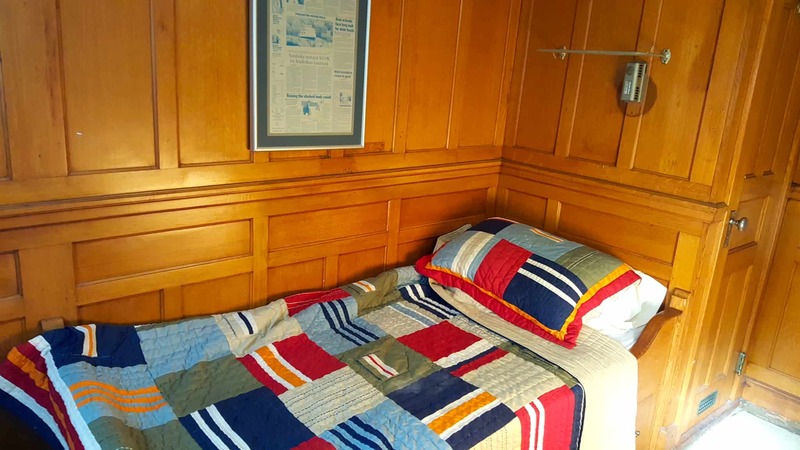 And although we spent most of our time in the spacious family room where a nice kitchenette and bar have been added I couldn’t help but peek in every nook and cranny of the ship! Remember that this stunning piece of history is a private residence so if you’re hoping to catch a glimpse of it head out in your kayak or peer off to the right of the Miller Ferry as you head onto the island. I’m so thankful to those who have a passion to live in such a unique location and keep an important part of history alive. 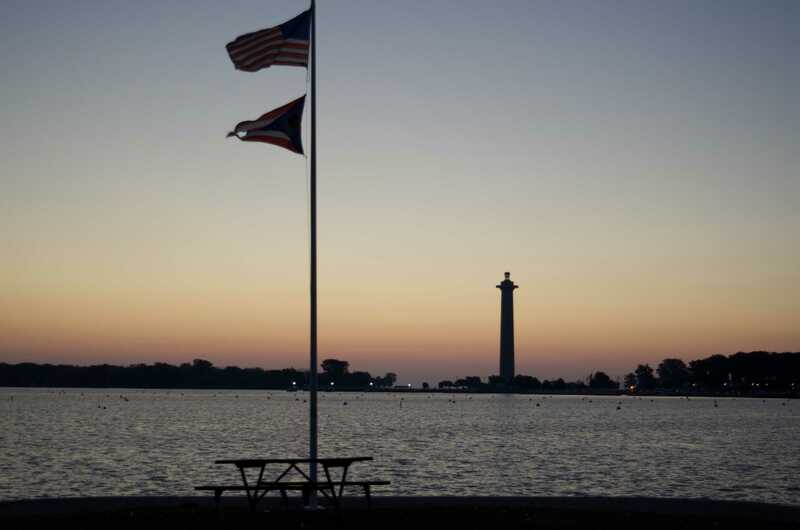 While driving between the Washington D.C. area to Chicago, Illinois we decided to make a quick stop in Sandusky, Ohio after seeing some brochures about the Lagoon Deer Park. 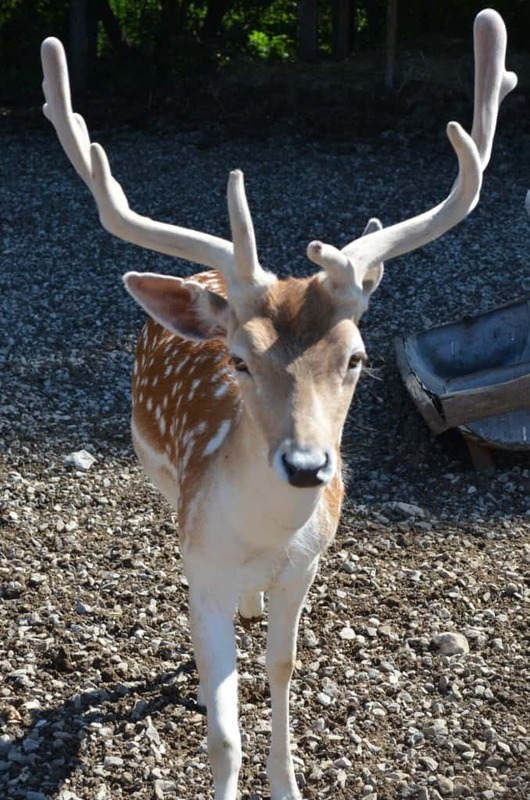 Essentially it’s a petting farm packed with deer (and other animals) which I KNEW was an absolute MUST for our family. Not only did I know my boys would go absolutely crazy over the unique opportunity to snuggle and feed oodles of deer but I could barely wait to get there myself! 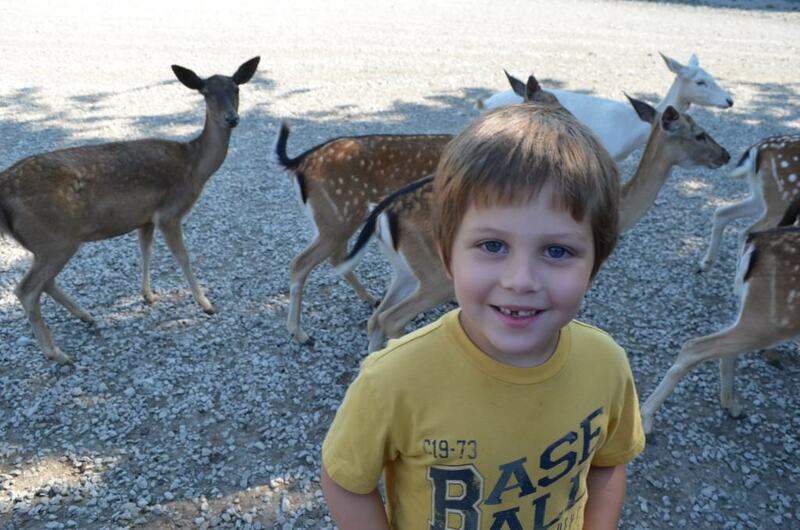 It cost us about $28 to get in but I didn’t care – where else can you huddle up with all sorts of deer? We were on our own after paying and I’d have to say it was everything we were hoping for and more. Yeah it was a little expensive, but after buying buckets and buckets of food my kids were just giddy with happiness. You walk out into a gigantic fenced in area where there are peacocks, deer, and llamas roaming free. Surrounding the fence it is lined cages of other species of deer and animals from all around the world. Animals I’ve never seen even the zoos so it was really quite an experience for us all. The deer were beyond friendly as you can imagine. It’s basically a free buffet any time people walk into their fenced yard so they are pretty savvy at what you’ve got coming in with you – peanuts and corn! My boys are 6 & 8 and not scared of much so it definitely didn’t bother them that the animals were all over us. Not aggressively, there were just a lot of them. 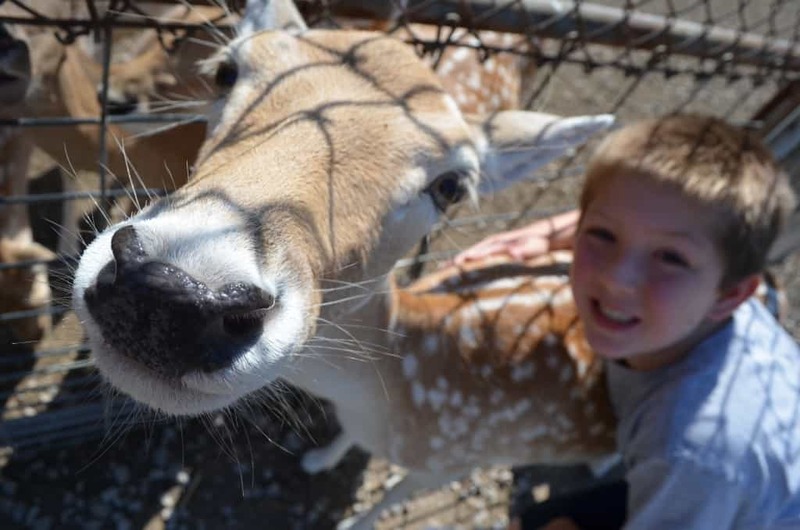 Smaller children or kids a little more hesitant of up close experiences might be a little more concerned. As you can see it didn’t bother us one bit! My husband did need to hold the food though because the deer were trying to eat through our container. We were very comfortable with the animals and even had our 7 month old in the stroller with us. She didn’t mind feeding the deer either! My recommendation for the BEST experience is to go immediately when they open. We were the only family there for the first hour so not only were all of the animals hungry but we had them all to ourselves. 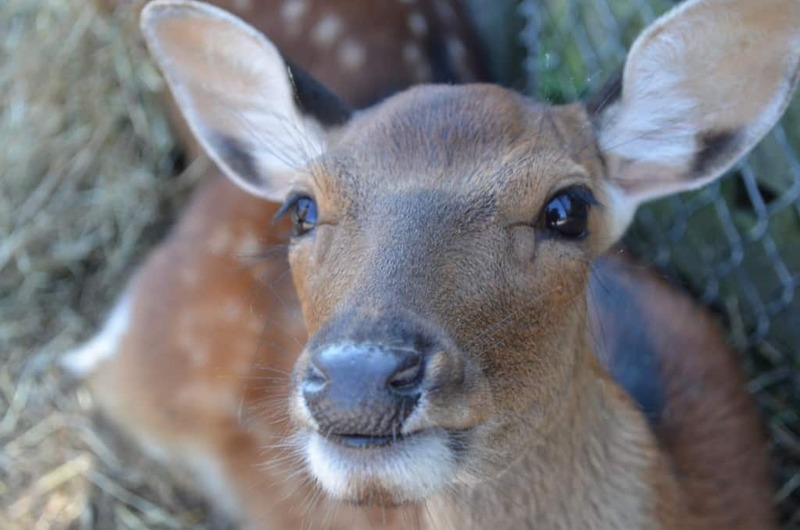 The price for bags of food to feed the deer was very reasonable and we went with the understanding that we would buy as much deer food as we wanted. We knew it might be our only opportunity! Unfortunately juggling taking photos and watching the kids I can’t even begin to tell you all the names of these gorgeous animals – this deer had fuzzy antlers! But there were truly many exotic breeds from all over the world. From someone with a biology degree and strong love for animals I was pretty impressed. 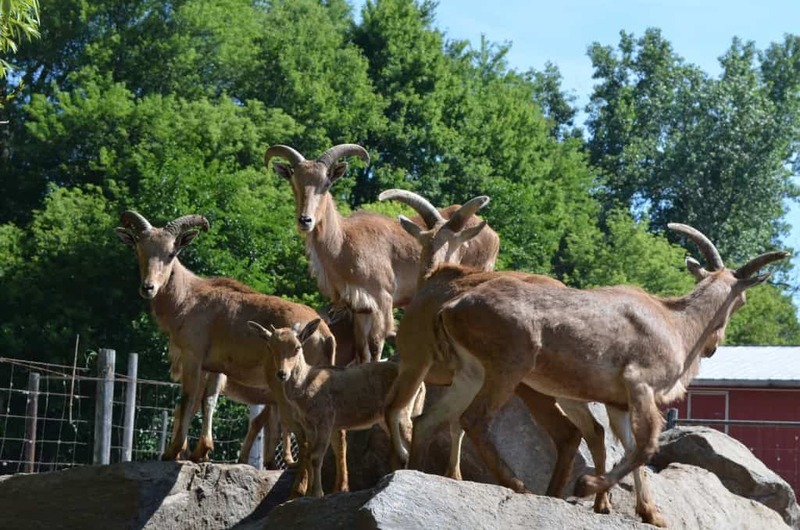 There were also mountain goats, pygmy goats, oxen, donkeys, and other various beasts that were all very active and looked very well cared for. These mountain goats were my favorite (after the deer of course) – every time you walked near they jumped up onto the rocks which was fun to watch. 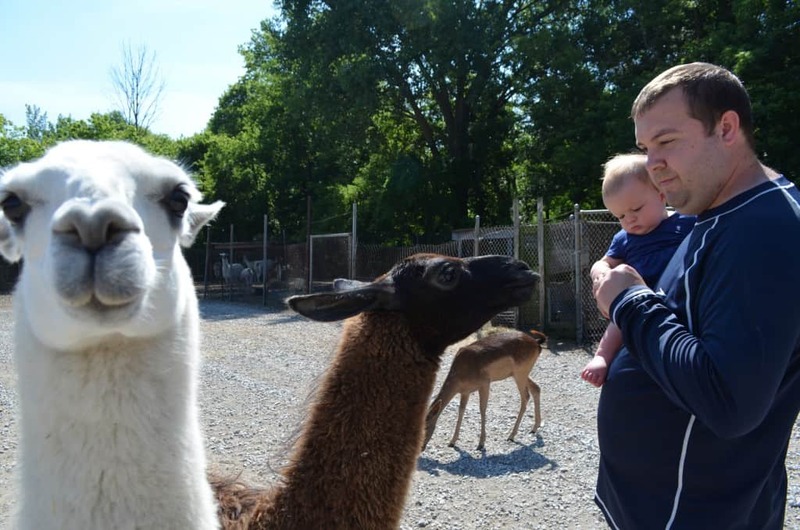 I’m not the biggest fan of llamas because somehow I always get spit on, hissed at, looked at funny, or I’m afraid they’ll bite me! These were a little more aggressive than the deer but were more pests than anything dangerous….otherwise we would not have brought the baby so close! 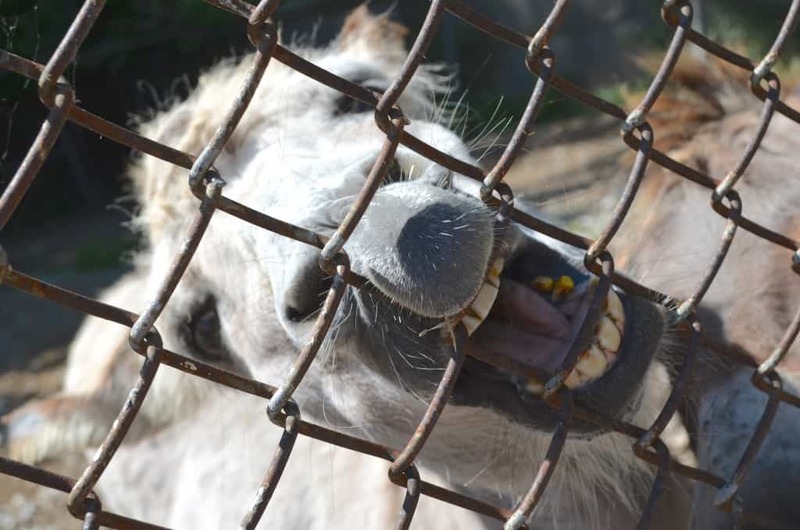 Yep – there’s that silly donkey! 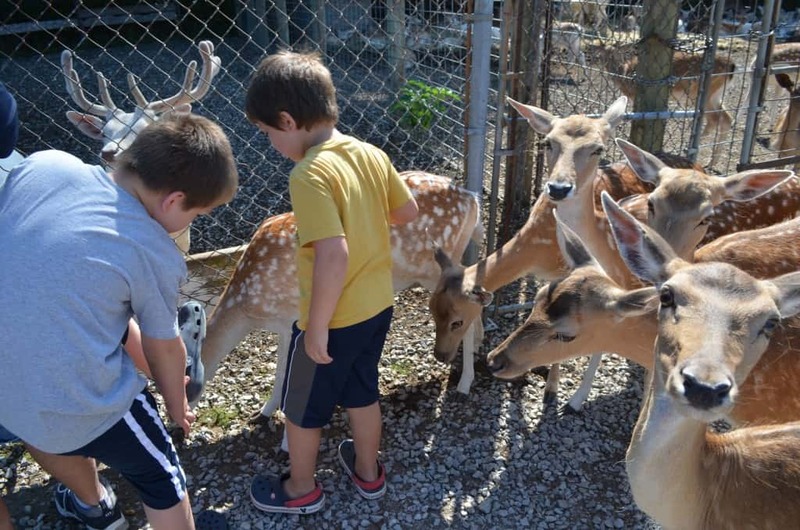 If we ever drive through the Sandusky area again I can guarantee you we’ll make a stop in at the Lagoon Deer Park. But next time we’ll bring our fishing poles. 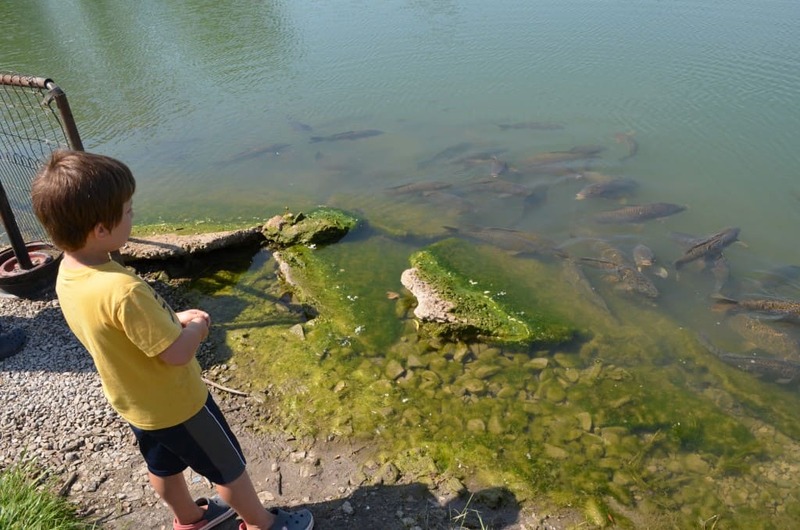 It was really hard seeing all the carp and fish greet us at the water edge when we walked up and not cast a line in! I spent quite a bit of time with my GoPro in the water since the fish pretty much let you pet them they were so tame and active but the water was incredibly murky so I didn’t catch much on the video.